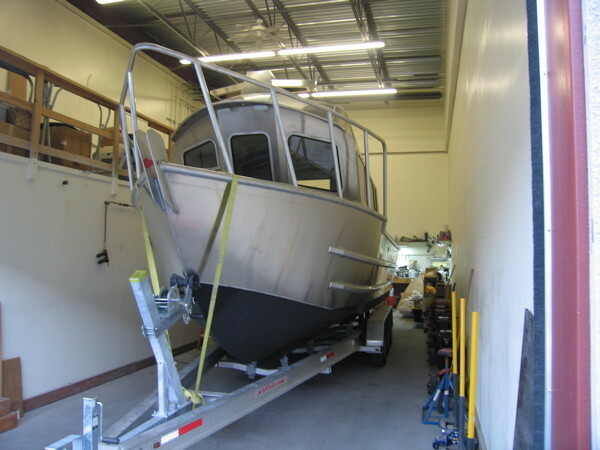 M/V "Nonnie Noozer": 2011 29' Aluminum Sportfisher: From Bare Hull to Completion. 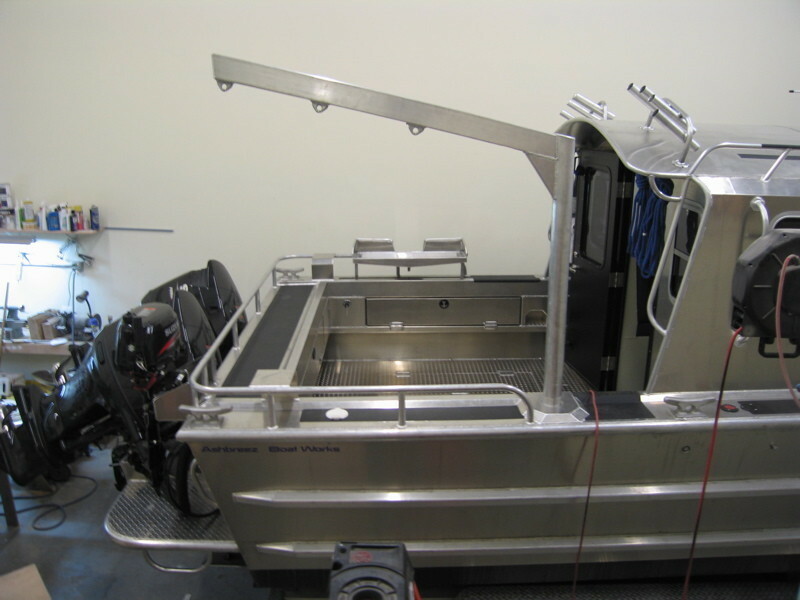 Fabrication: As seen in the photos below, the work of completing the decks, both interior and exterior has begun. 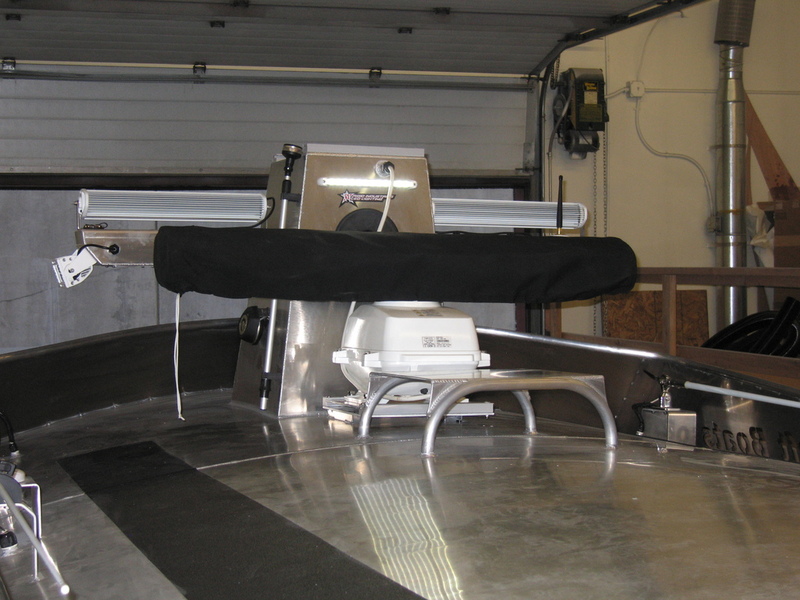 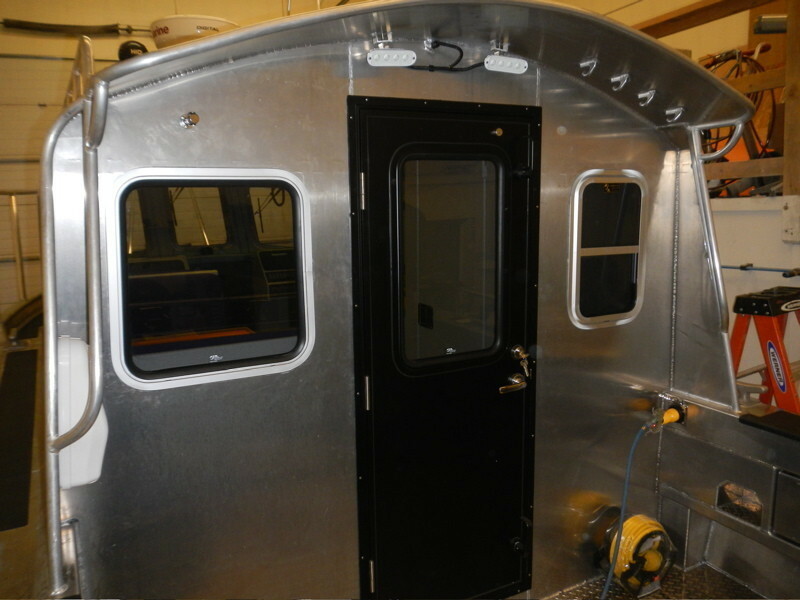 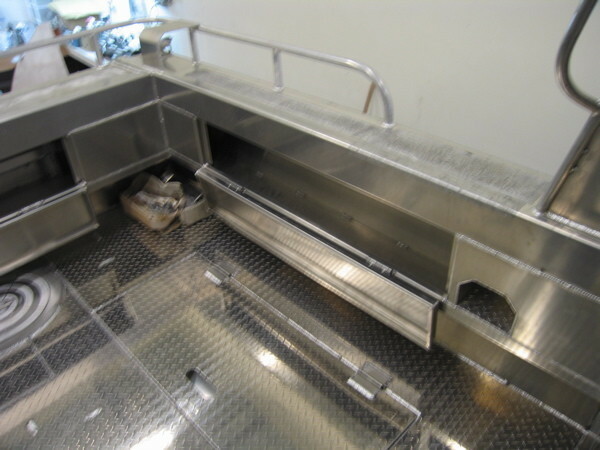 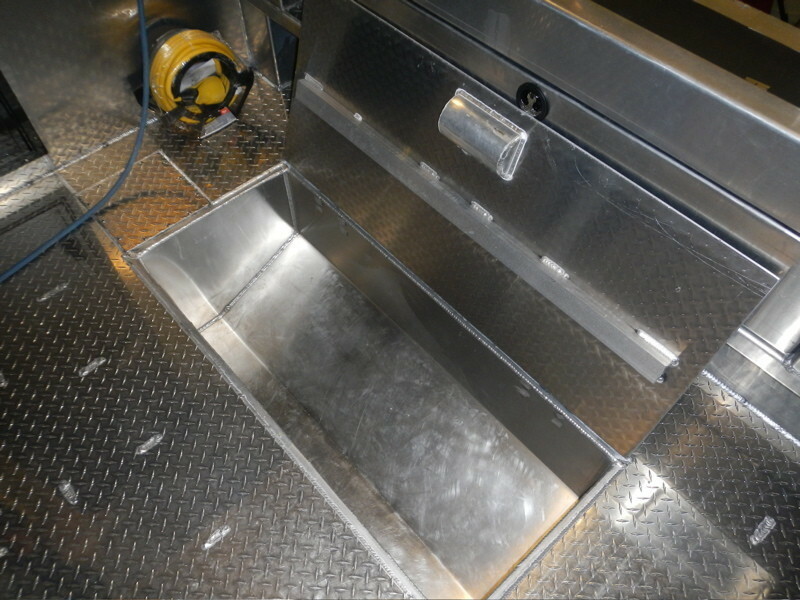 The diamond plate aft decks/fish holds, aft handrails, and aft compartment doors were fabricated by Greatland Welding and Machine in Palmer, Alaska. 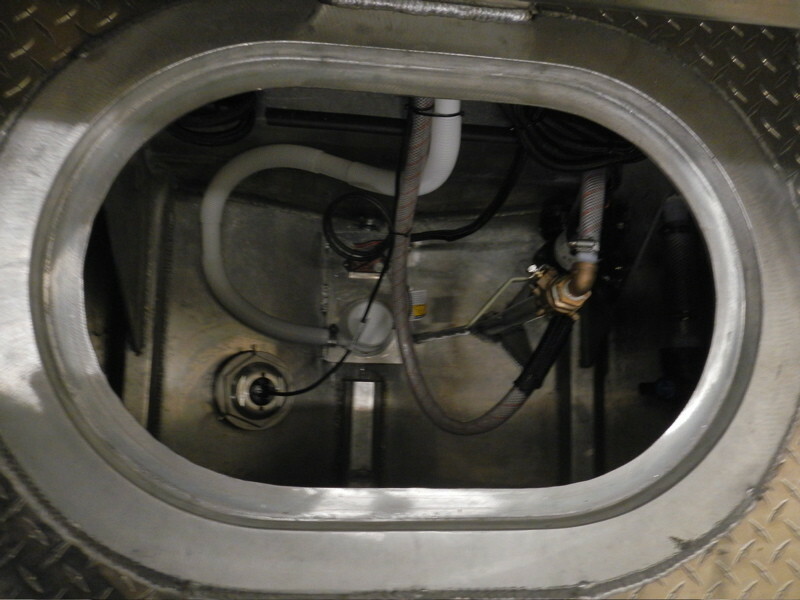 They also fabricated the aft flotation compartment under the outboard engine platform, a design addition that the original designer of this vessel began adding to these models. 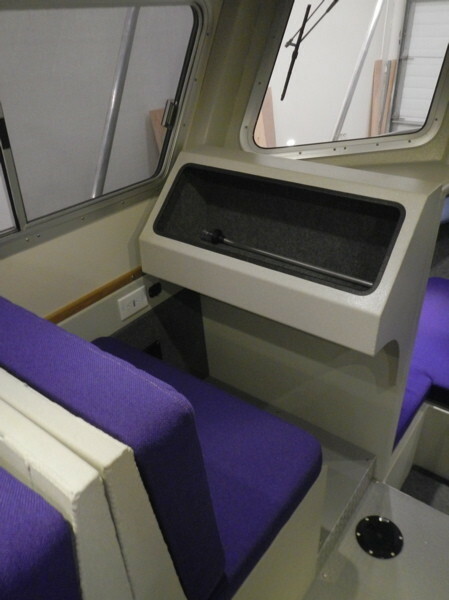 Greatland also fabricated the seat and galley boxes. 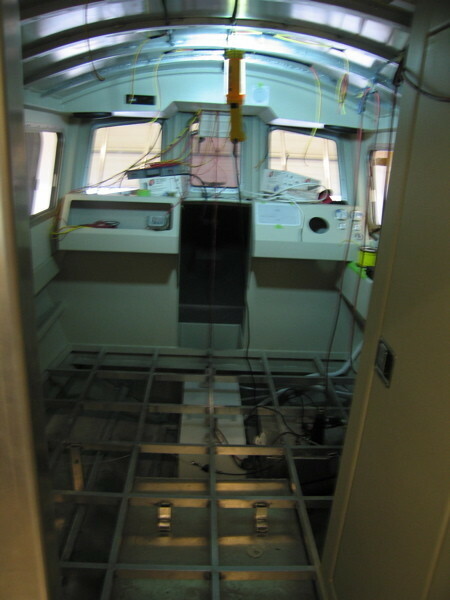 Joel was onsite at Greatland for much of this work, laying out the cabin, assisting with fabrication of the interior pieces, etc. 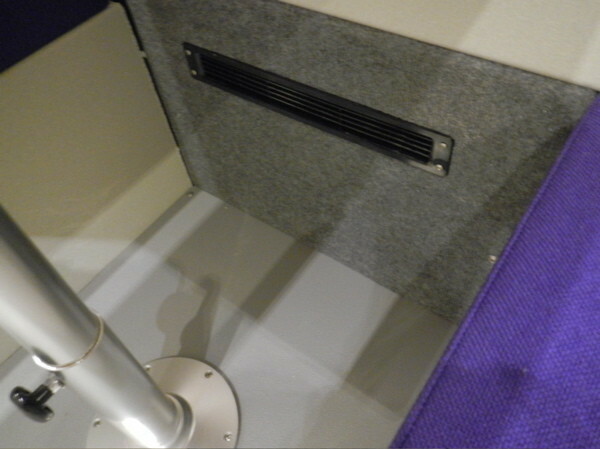 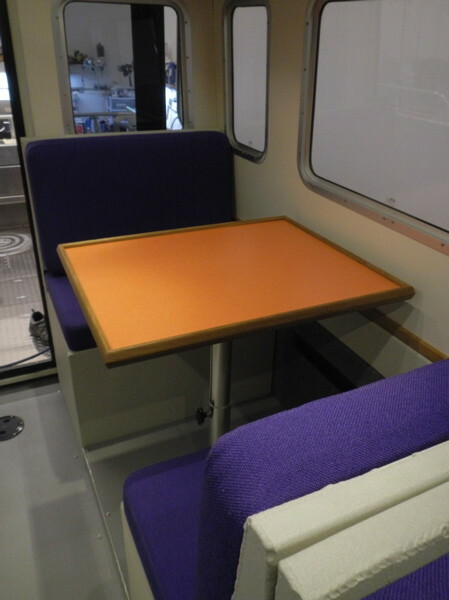 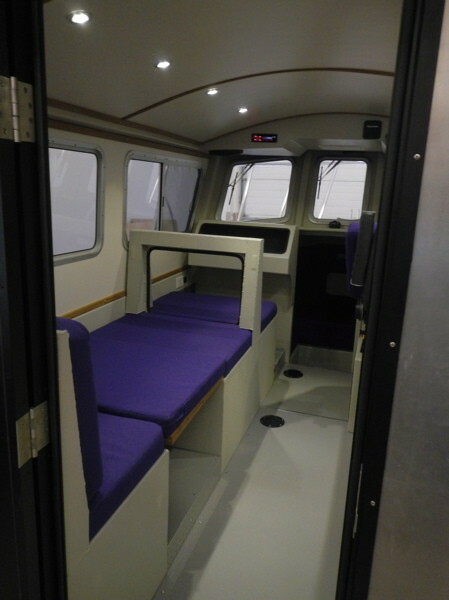 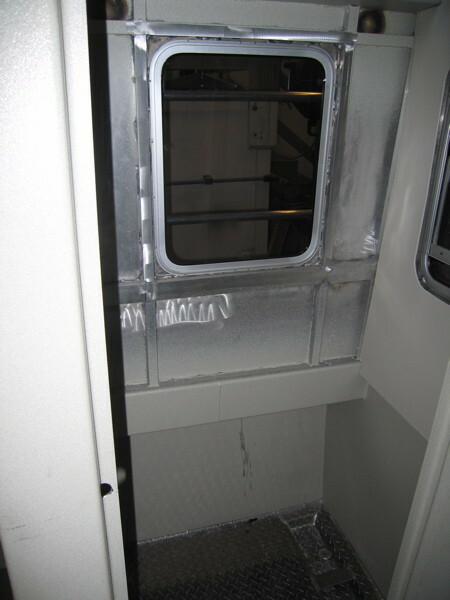 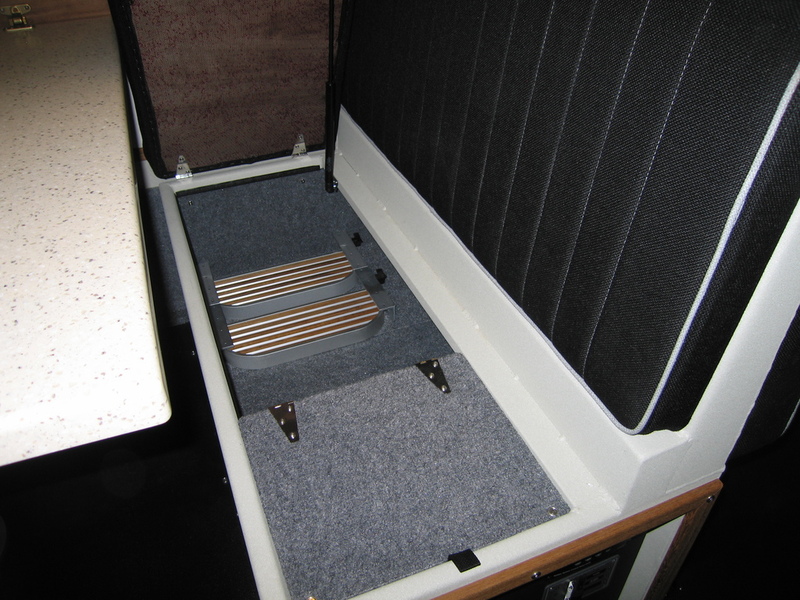 The seat boxes, custom designed to meet the needs of the owner’s height when the dinette is converted to a berth, as it was designed to do, were finished with Zolatone. 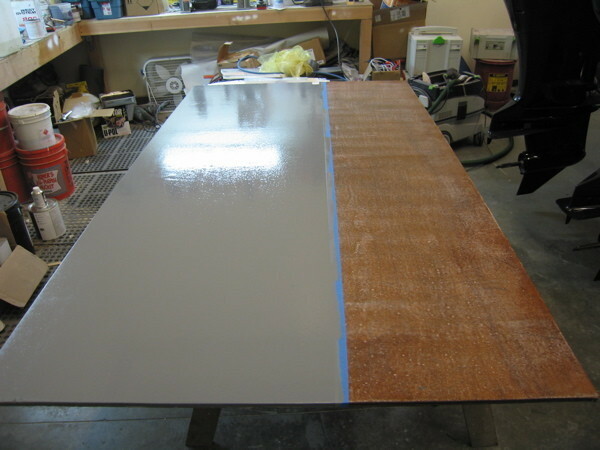 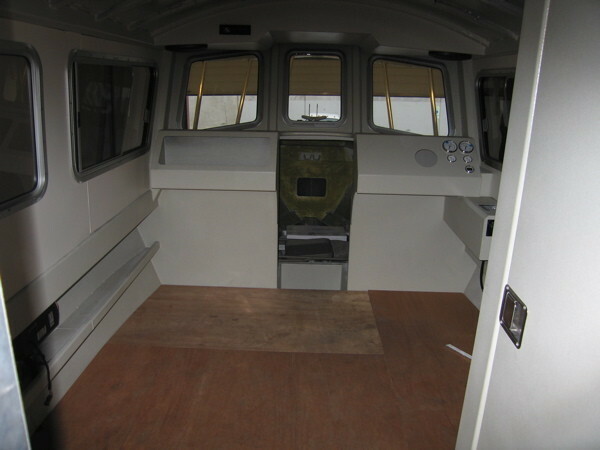 Additionally, the interior floorboards were cut out, encapsulated, finished, and installed on the pre-existing deck structure that we padded with rubber. 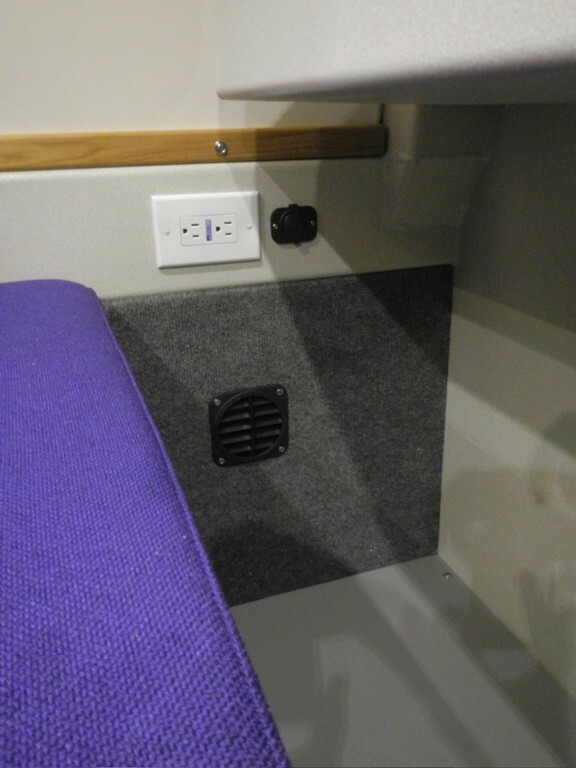 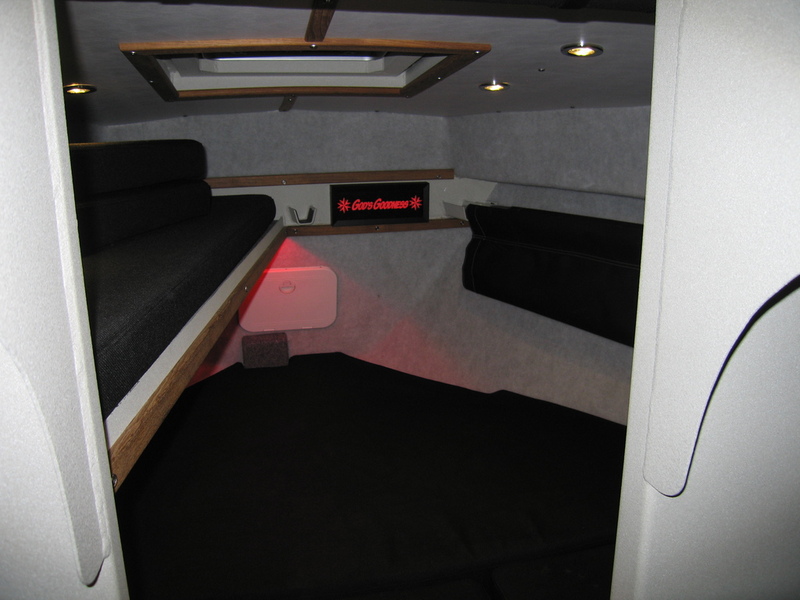 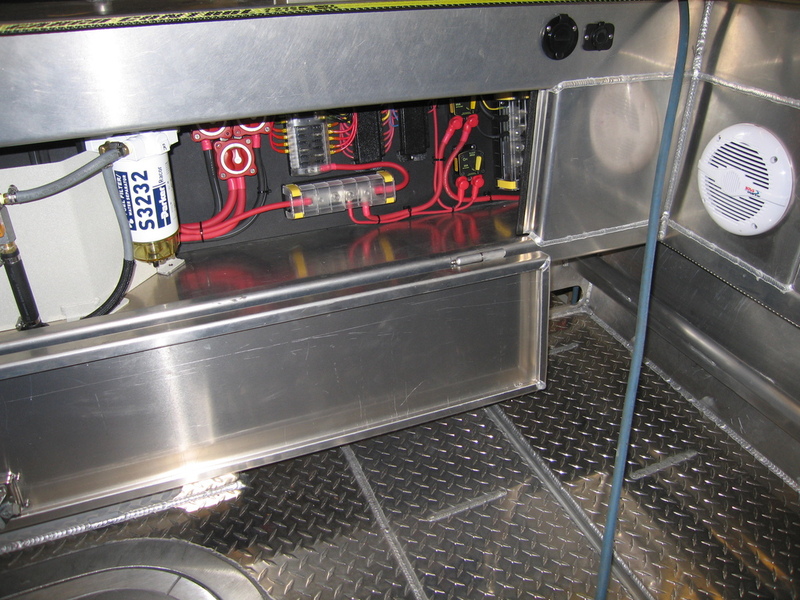 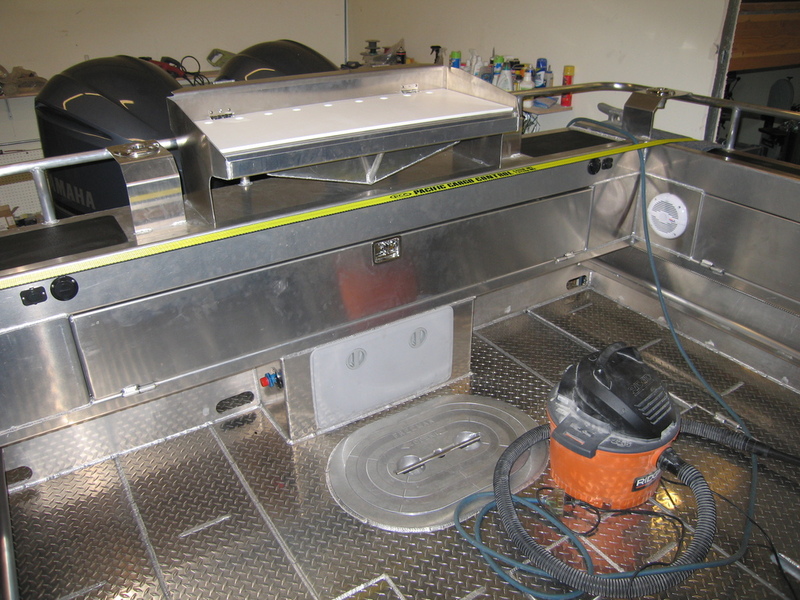 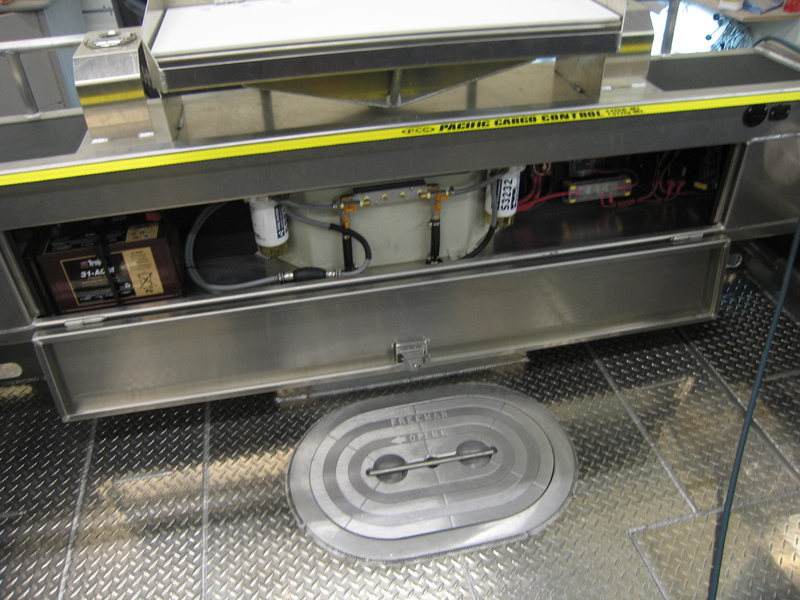 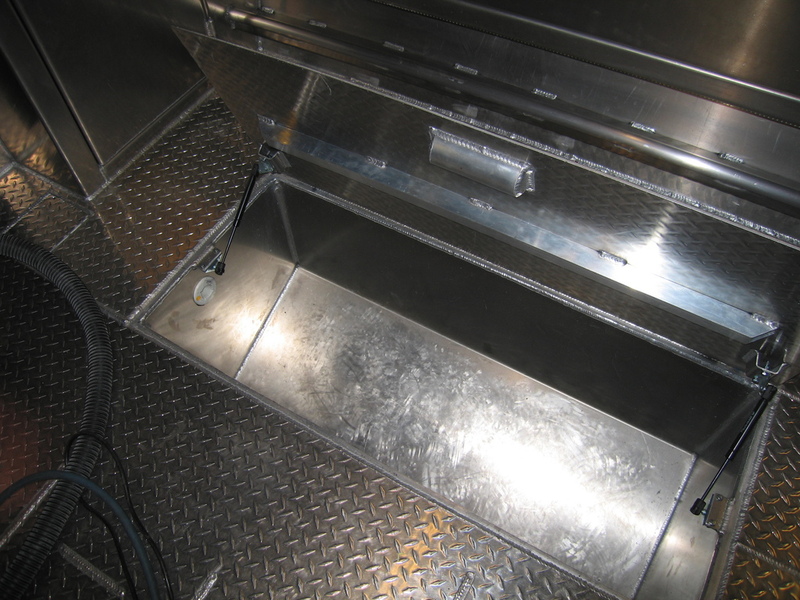 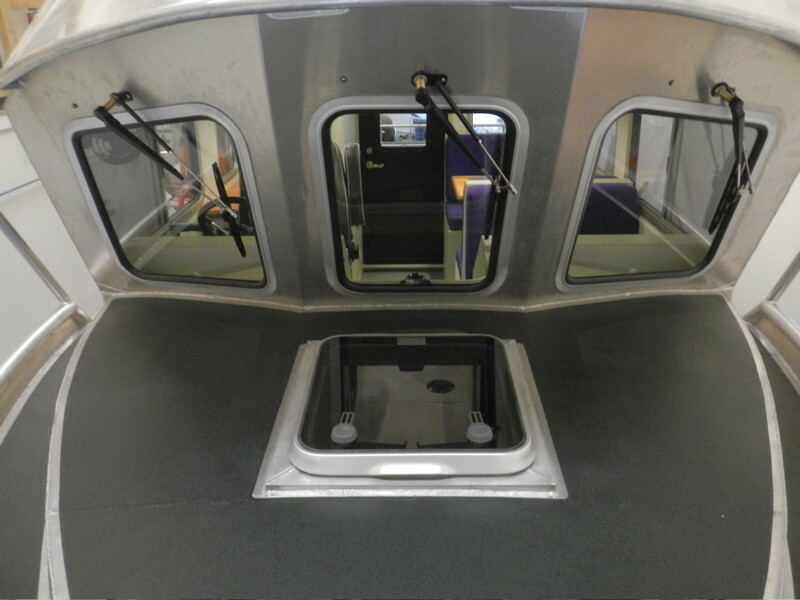 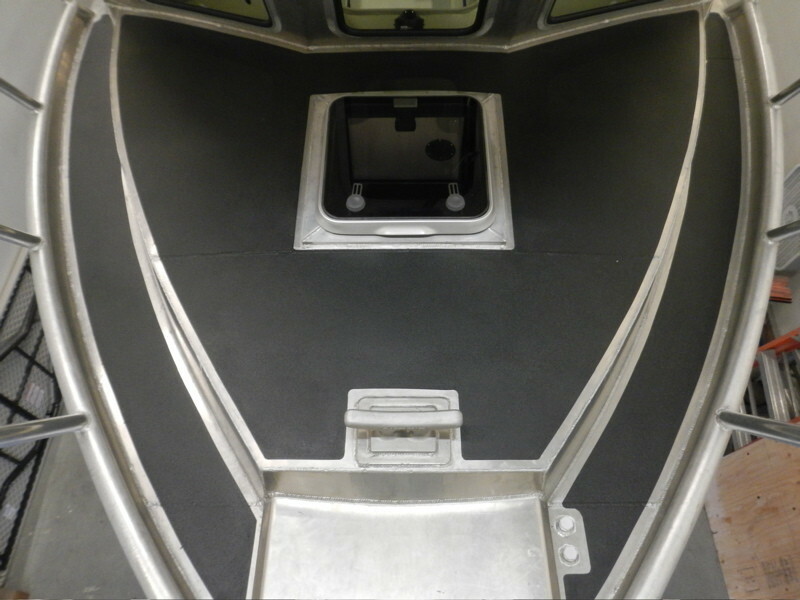 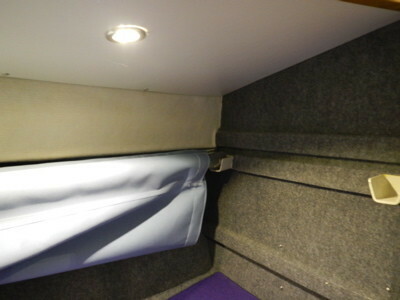 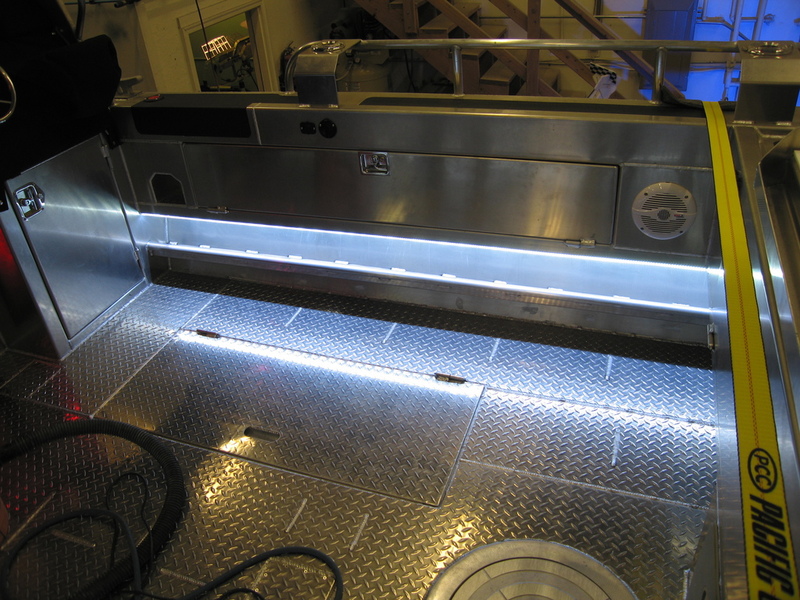 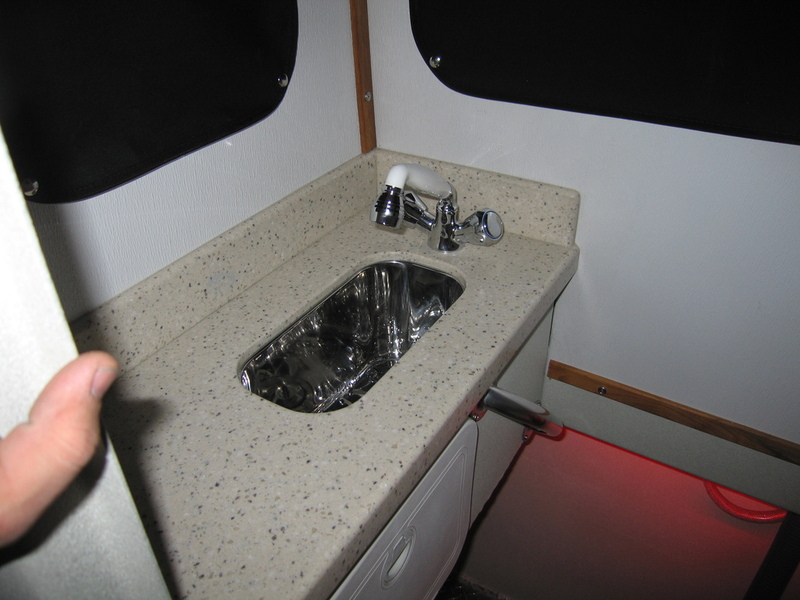 Interior 1: The V-berth was carpeted and the overhead headliner, with recessed lighting fixtures, was installed. 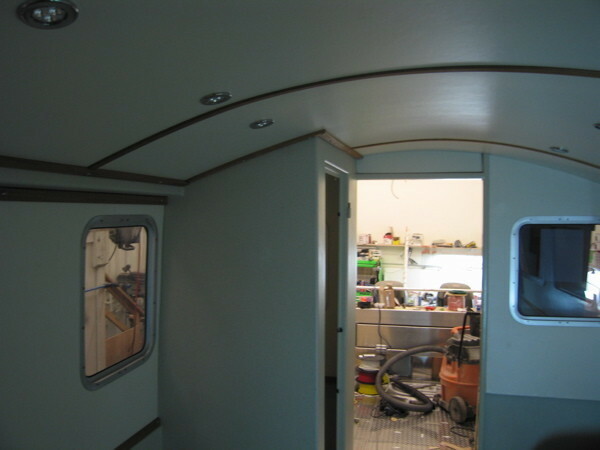 The trim is teak. 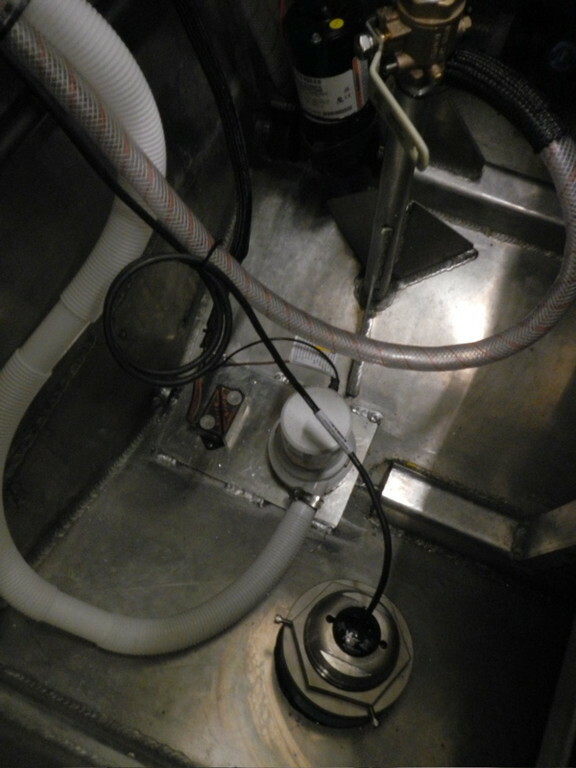 The fixtures port and starboard at the bow are pipe holders for pipe berths that will be installed later. 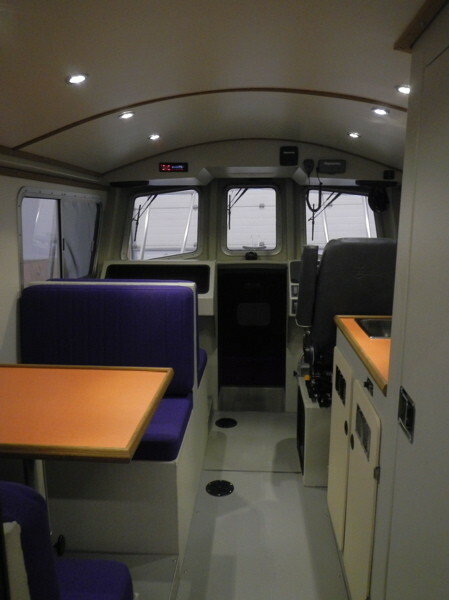 In the main cabin, the head and wall liners are installed, as are the recessed lighting fixtures and teak trim. 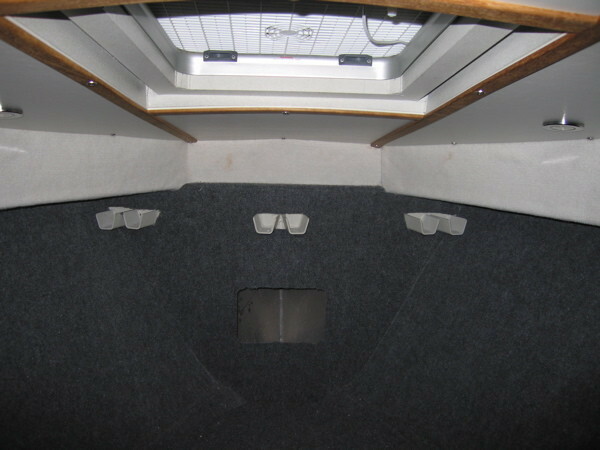 The interior of the head has been finished in the same way. 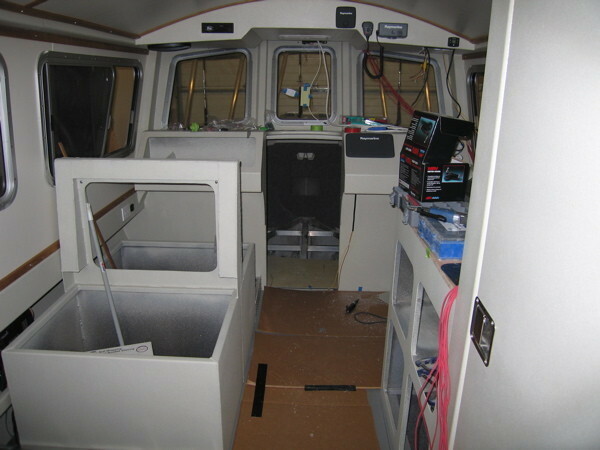 Looking forward, you can see that Jordan Morse has begun the wiring and systems layout. 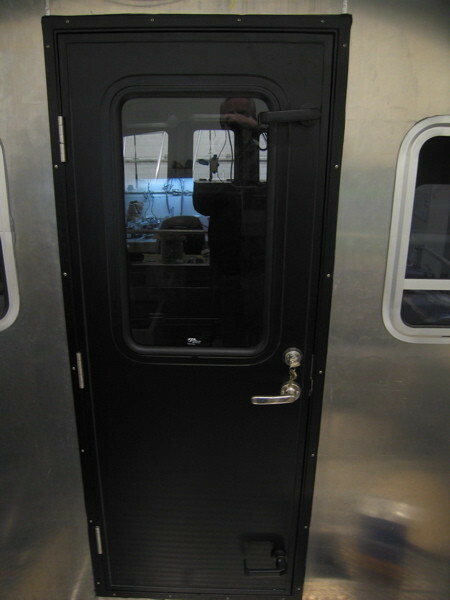 The exterior door, made by AJR, was installed, custom fabricated from measurements sent to their factory. 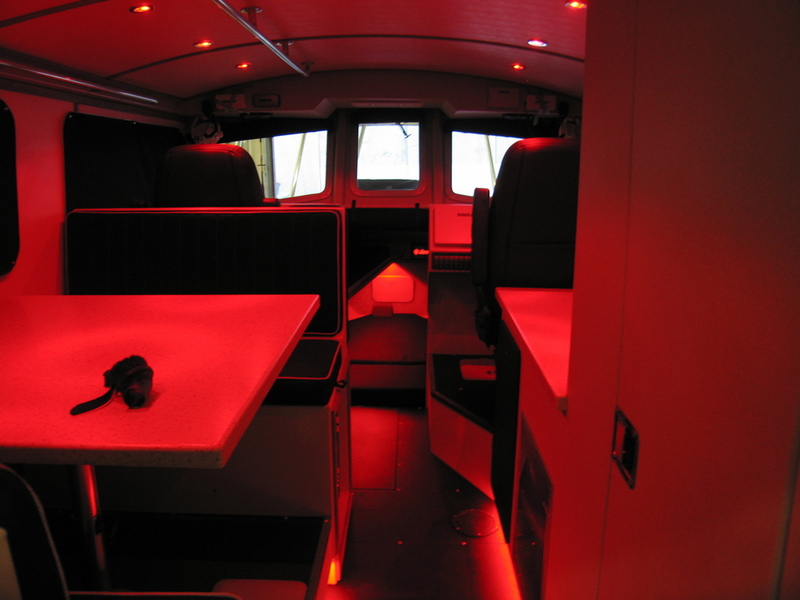 Interior 2: Interior work and systems installations progress. 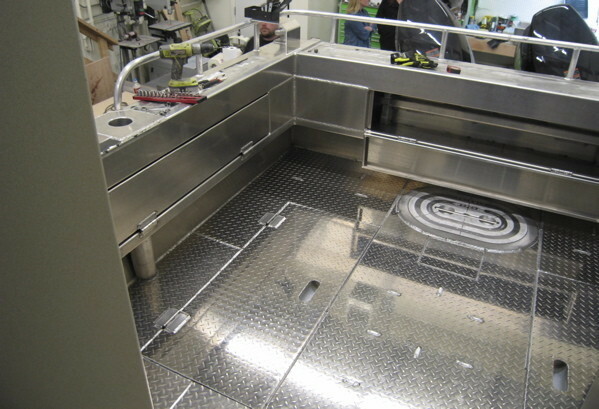 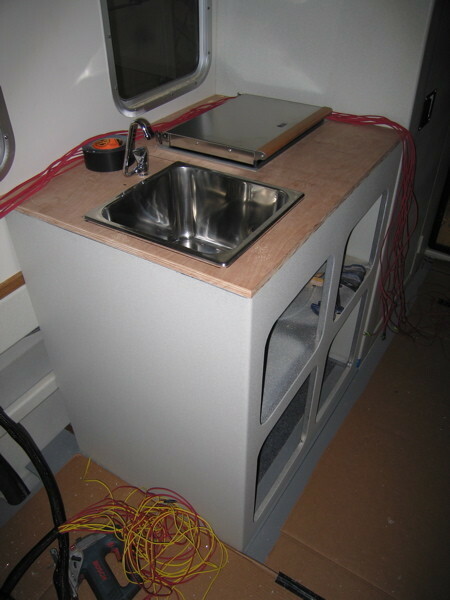 Here, you can see the fabricated seats and galley cabinet are installed and work has begun on roughing out the galley counterop, which will include the sink, it’s fixtures, and a Wallas countertop stove. 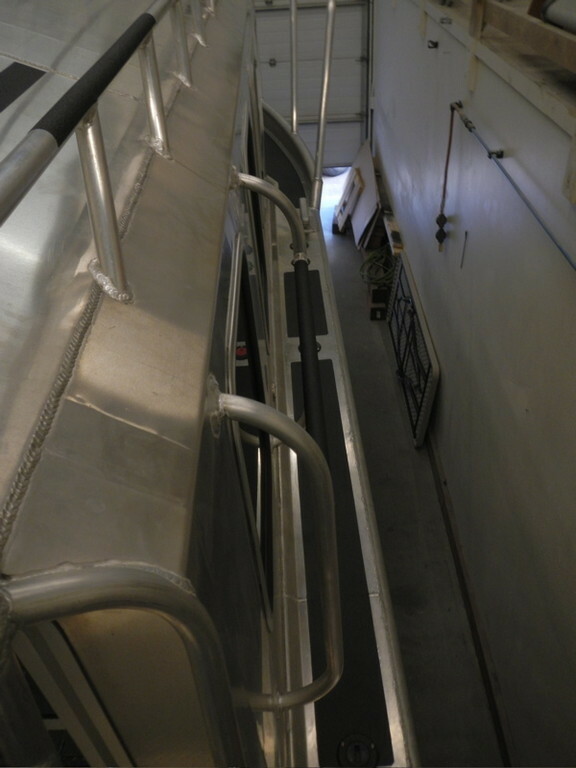 The v-berth platform is being built, as well. 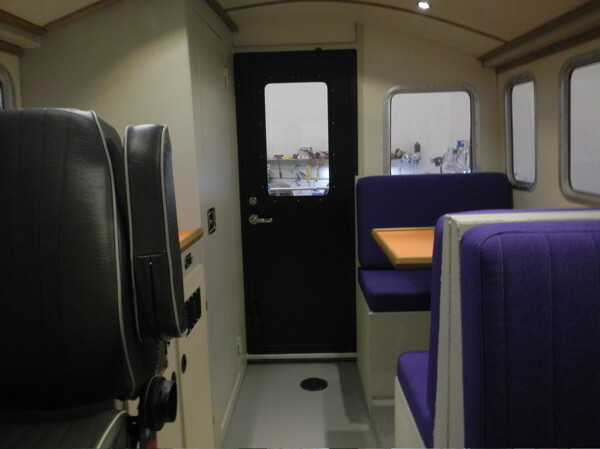 Main Cabin: Look at this beautifully finished interior! 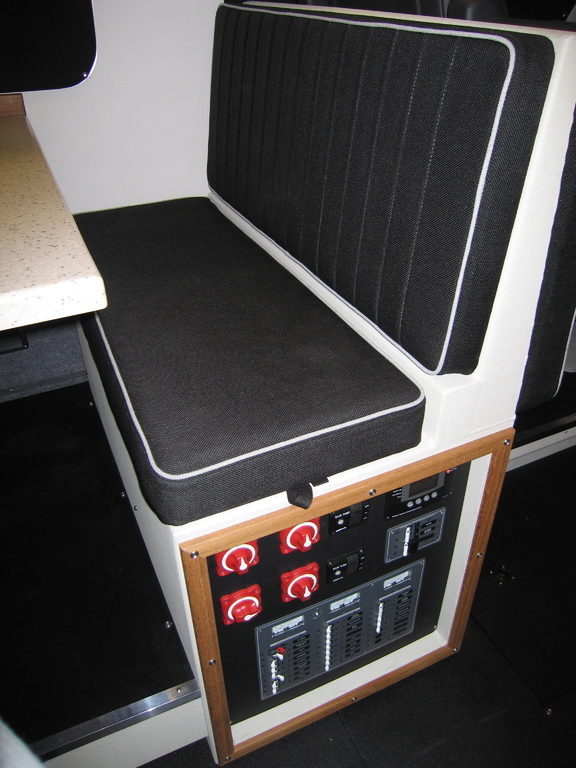 The customer chose his desired colors and Kevin’s Upholstery in Chugiak/Peter’s Creek made the cushions, pipe berths, and v-berth cushions according to the patterns provided by us. 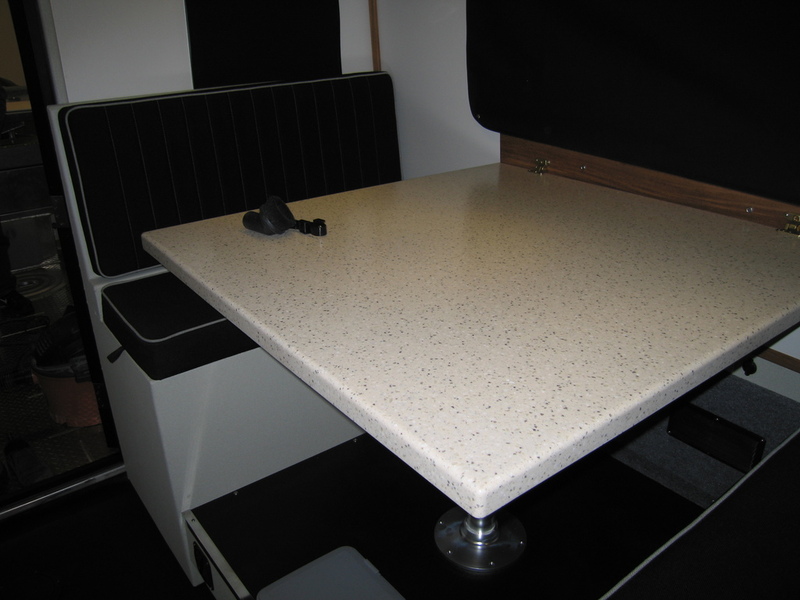 Joel made the table, which is designed to be lowered, allowing the dinette to double as a berth. 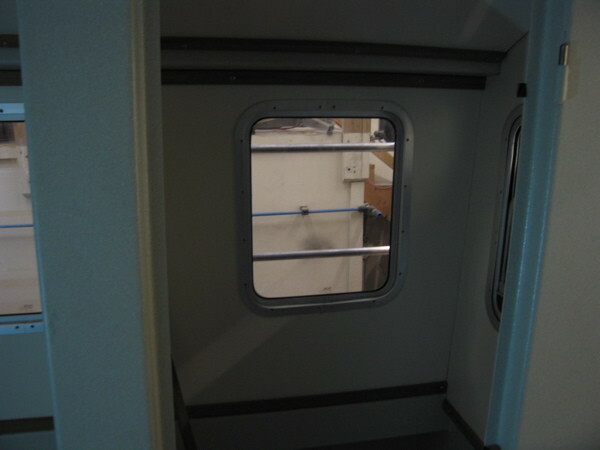 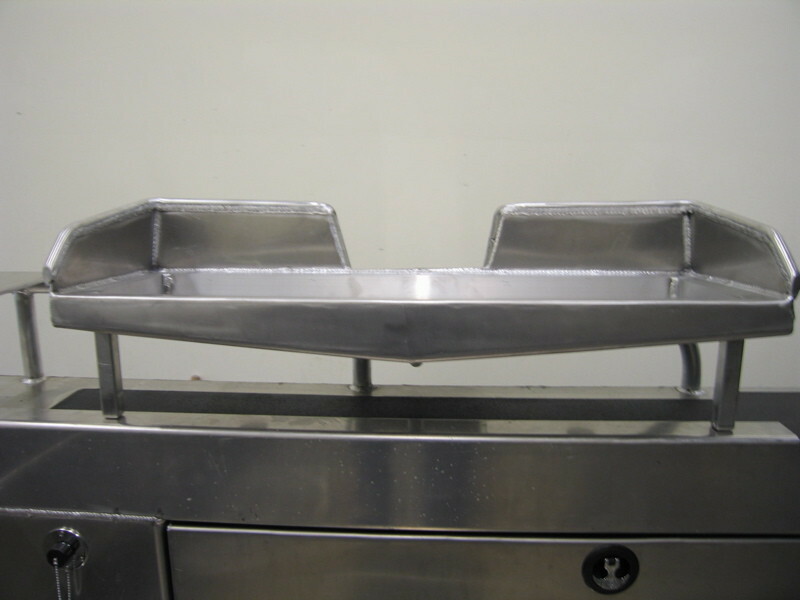 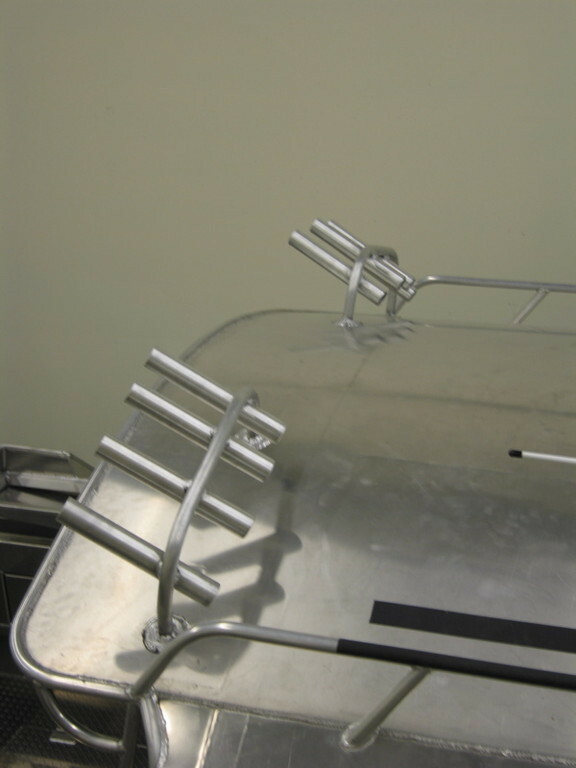 Because of the customer’s height, the co-helm seat was designed in such a way to allow it to become a berth extension. 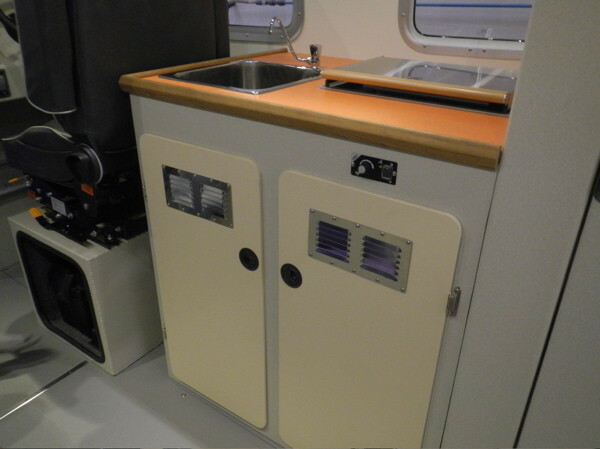 The galley cabinet has a Formica countertop, trimmed in teak. 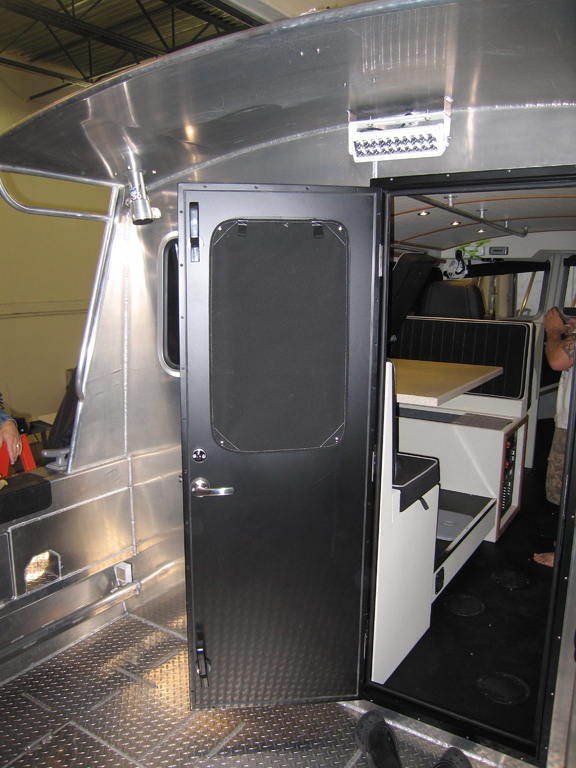 The doors were also custom made. 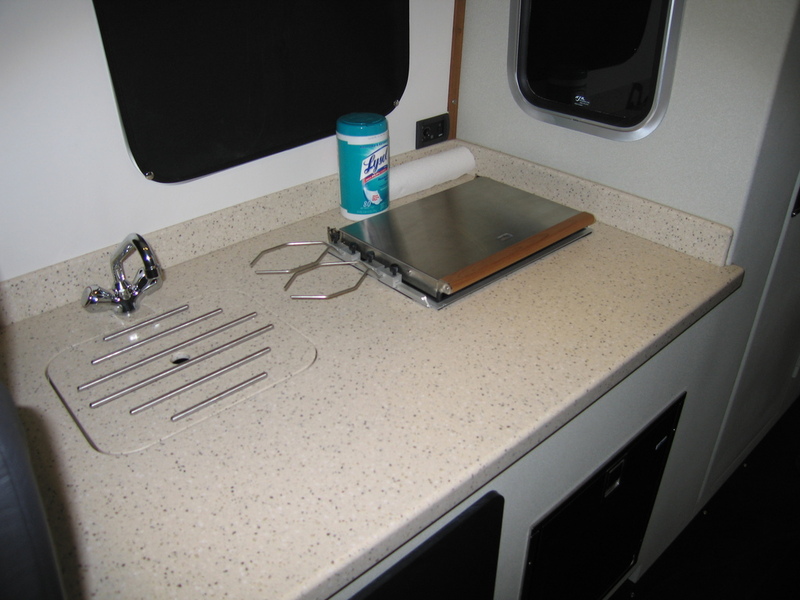 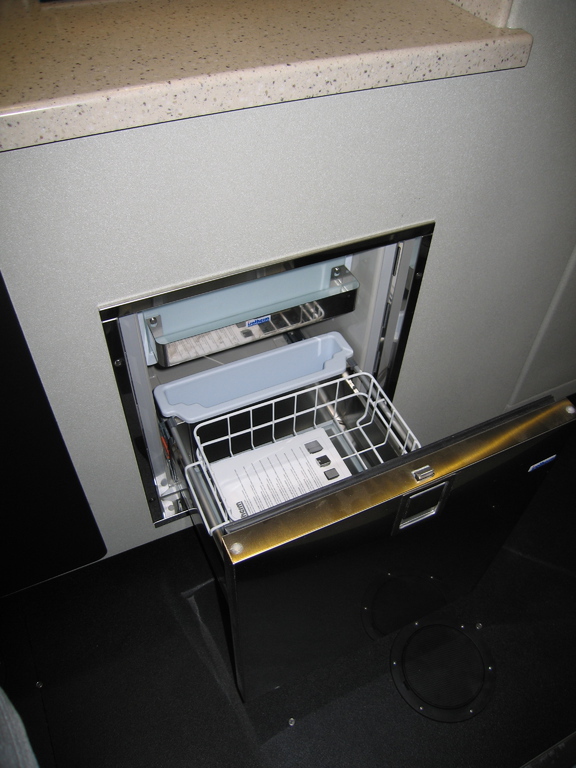 The Wallas cooktop stove is installed, as are the other related galley fixtures. 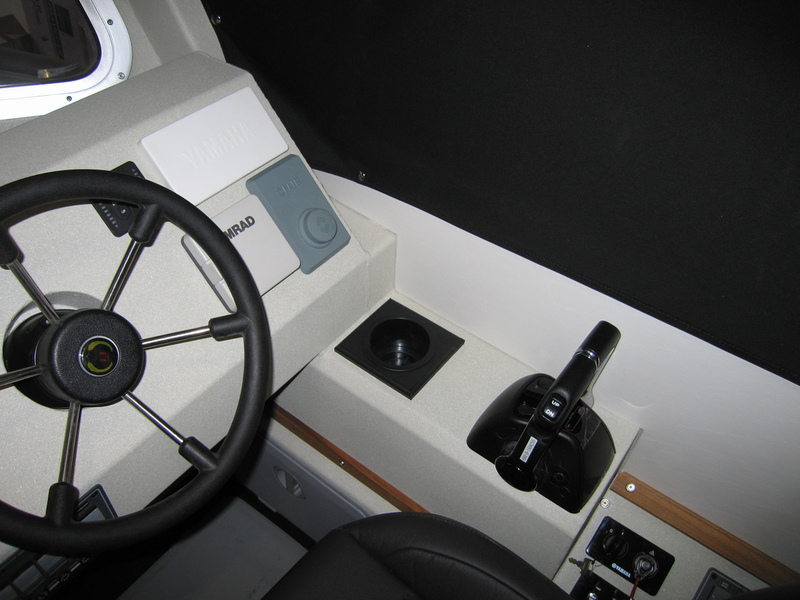 The co-helm seat allows the first mate plenty of leg-room and visibility. 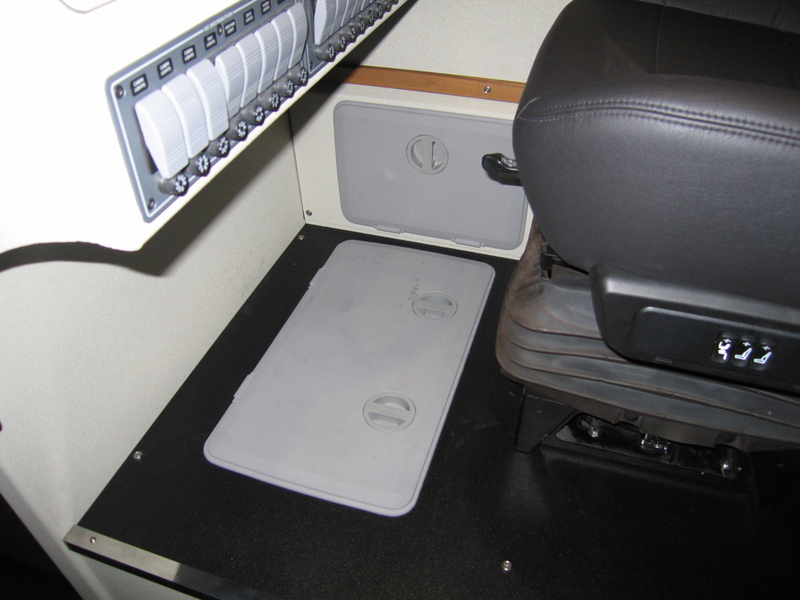 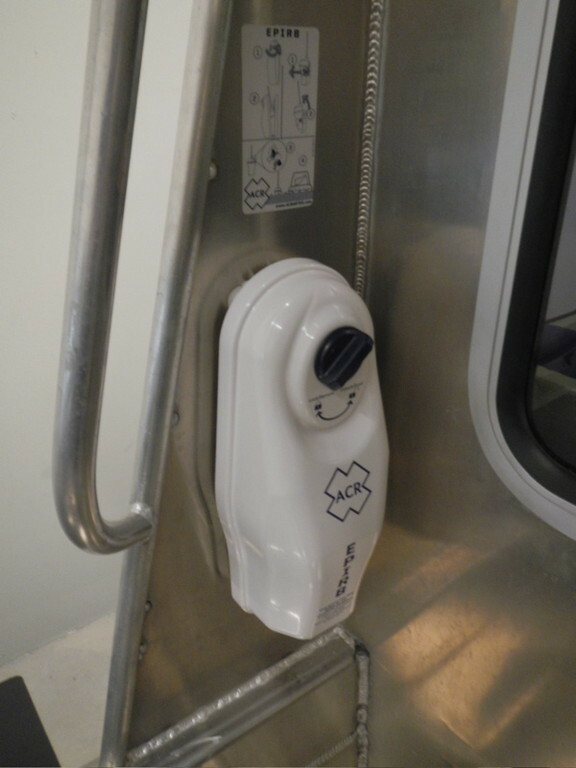 One can sit there in comfort, as there is a register that provides plenty of heat from the Espar Diesel heater. 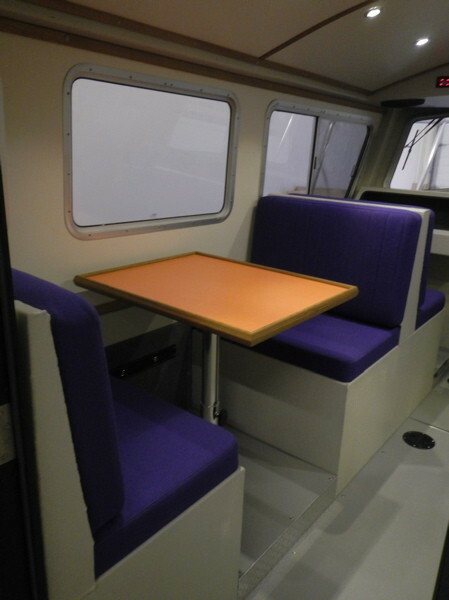 There is also a register for the dinette and for the starboard side of the cabin, as well. 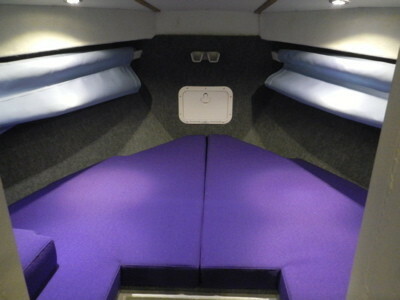 The head compartment is also complete. 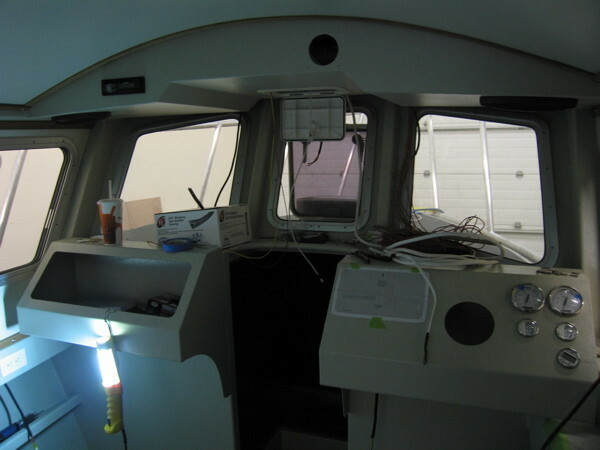 Helm Station: The helm station, as seen below, is the nerve center for the vessel’s electronic and electrical systems. 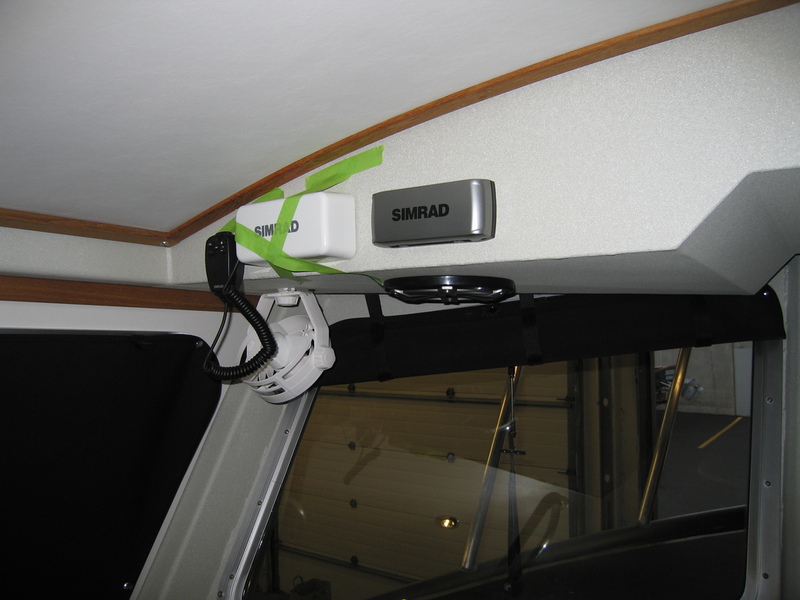 Raymarine products were chosen for the electronic systems and installed by Jordan. 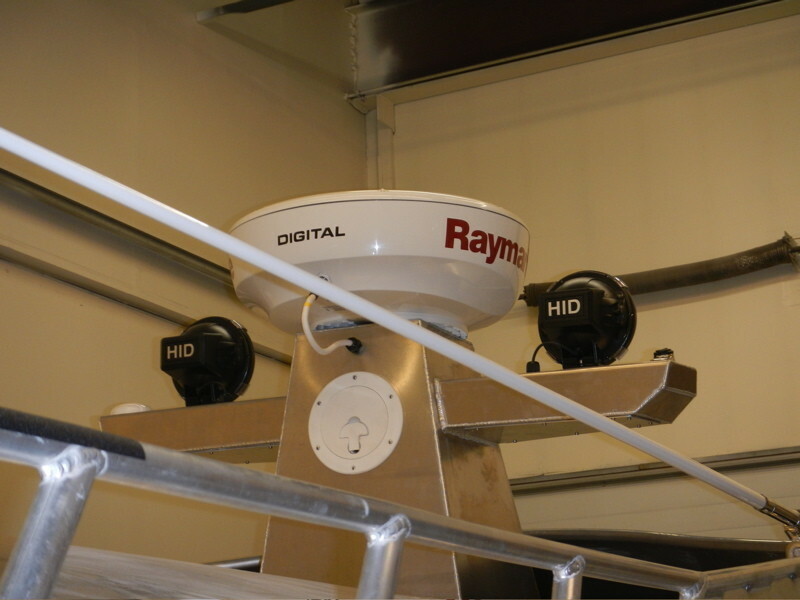 The systems include a Raymarine C9 with Ipad connectivity, DSM 300, 1kw tilted element transducer, 4 kw, 48 km HD color radar, autopilot, NEMA 2000 interface and VHF Radio. 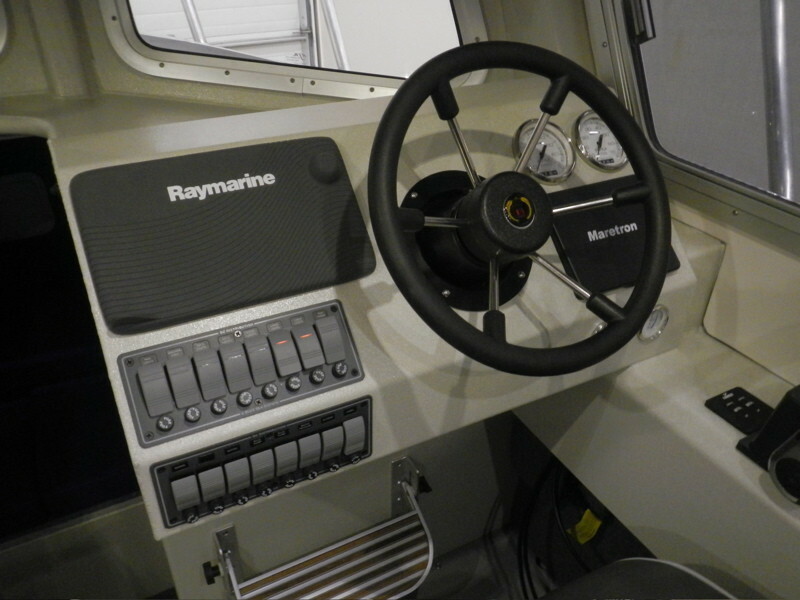 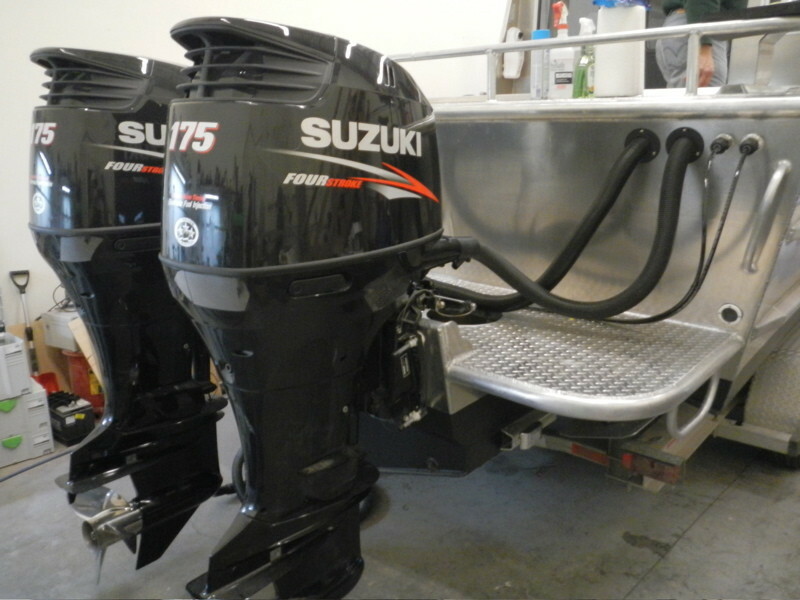 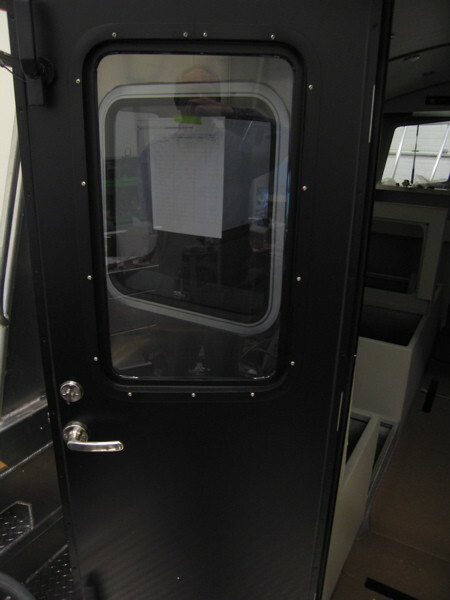 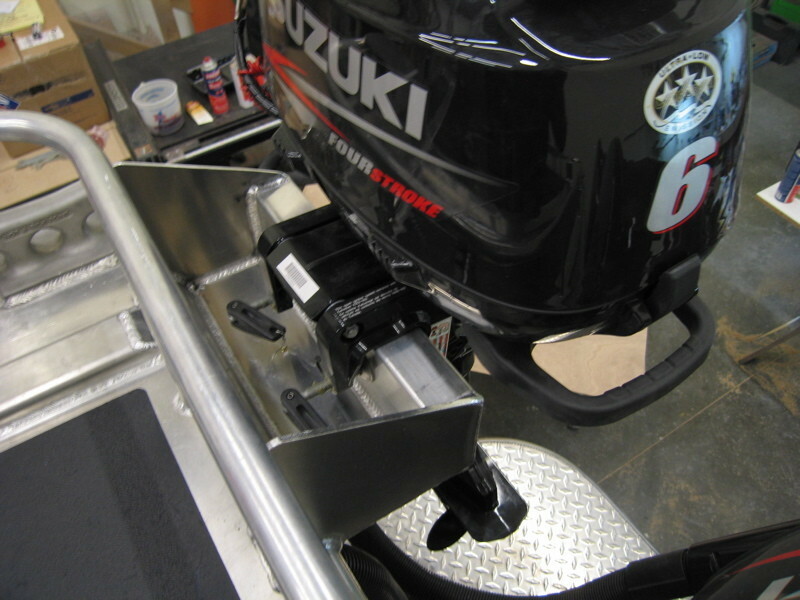 Additionally, a Maretron 5” multi-function screen, tank level sensros, fuel flow meter, engine monitor, and Suzuki interface model were installed, all interfaced to the Raymarine system. 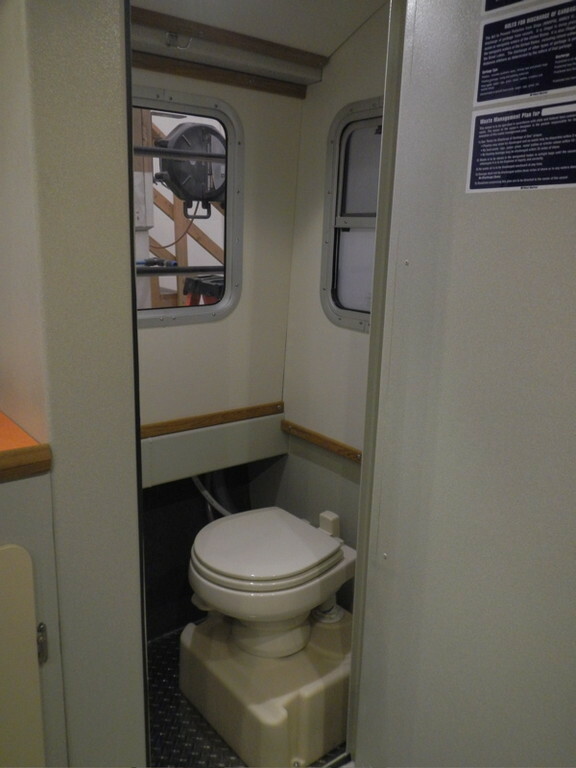 No small feat! 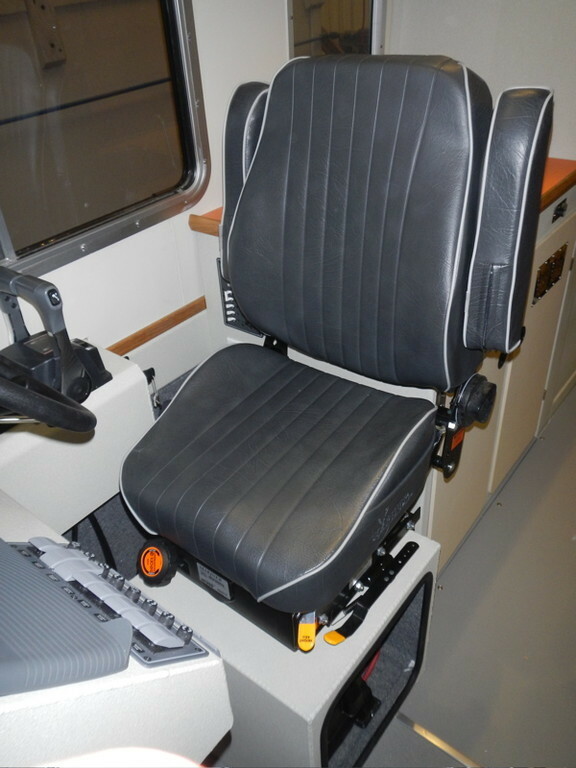 The captain will have a comfortable ride in his helm seat and the footrest is foldable so entering and exiting the helm area is obstacle free. 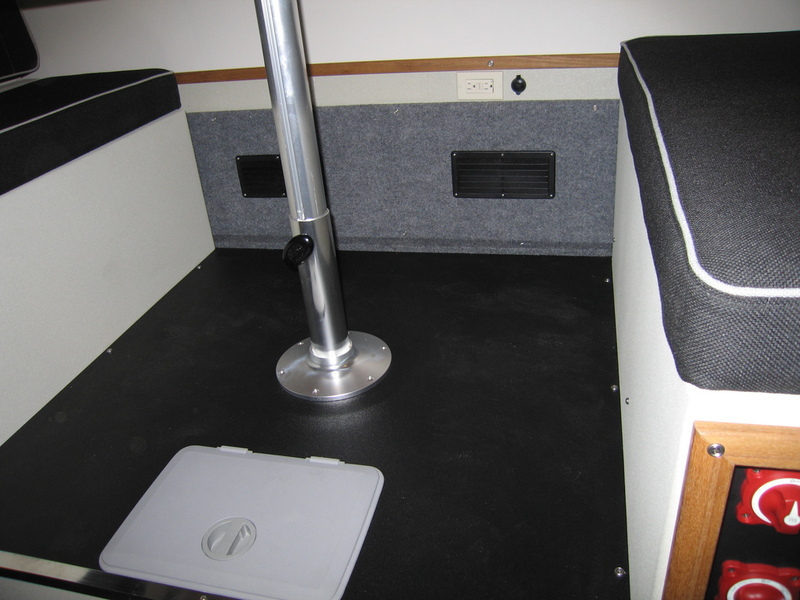 The v-berth is cozy and comfortable. 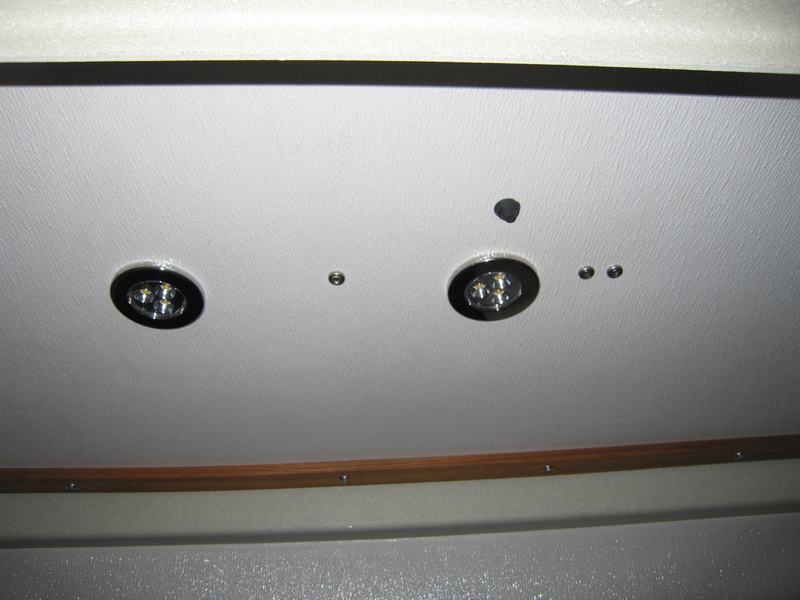 This area also has recessed lighting. 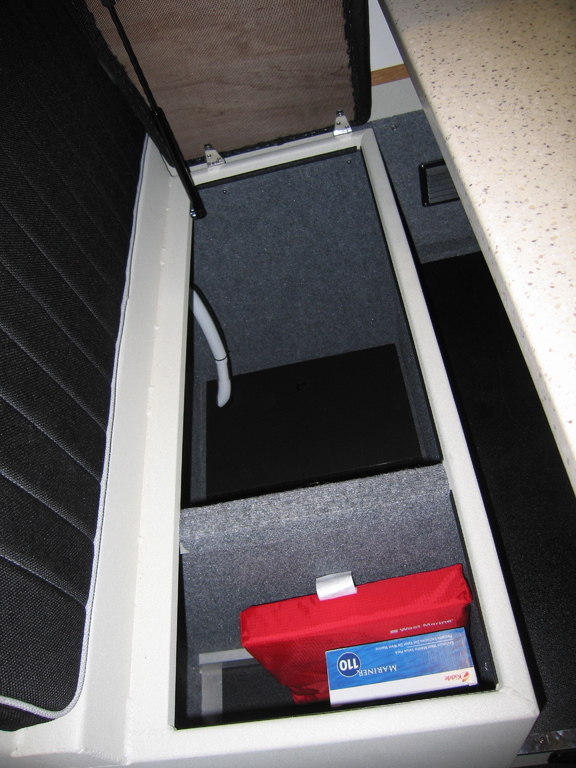 Currently in the folded position, the canvas pipe berths, when extended, serve as a storage area over the v-berth, a creative idea for use of that space. 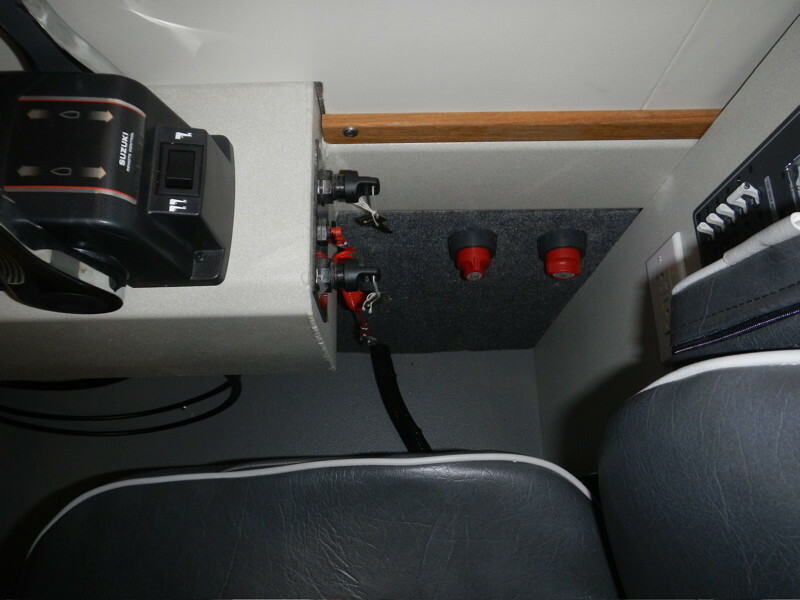 Exterior: And, finally, some views of the exterior… These photos include images of: the EPIRB mounted on the aft cabin; welded coat hooks; fish boxes; battery switches; fuel filters; hydraulic pumps; trim tabs; LED lighting for the aft deck and dual HID forward lights mounted on the radar bridge; heavy-duty windshield wipers for the forward pilothouse windows; and new non-skid paint on all the forward and side decks. 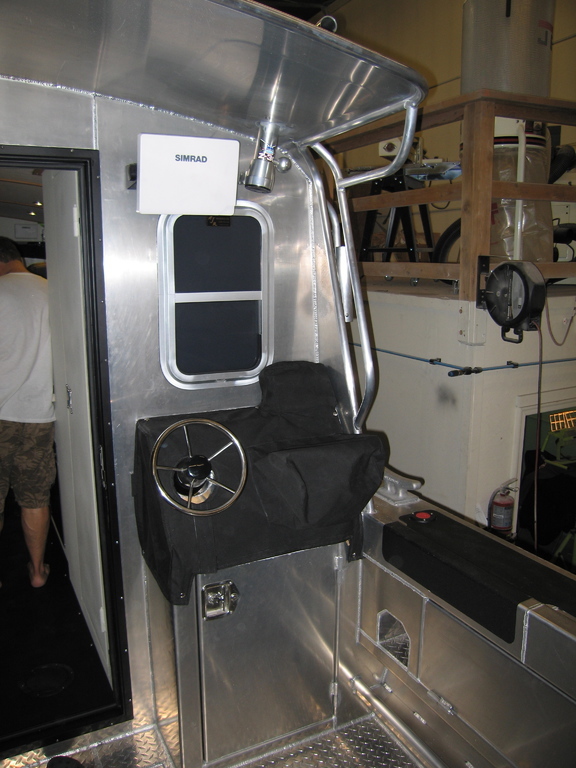 Addiitonally, Joel transported the boat back to Greatland Welding for fabrication and installation of an outboard storage bracket; moveable (port/starboard or stern) bait/fish cleaning station; fishing rod holders (split to port/starboard so as to not impede dinghy storage on the cabin rooftop), and a removable crane, which is not rigged in the picture. 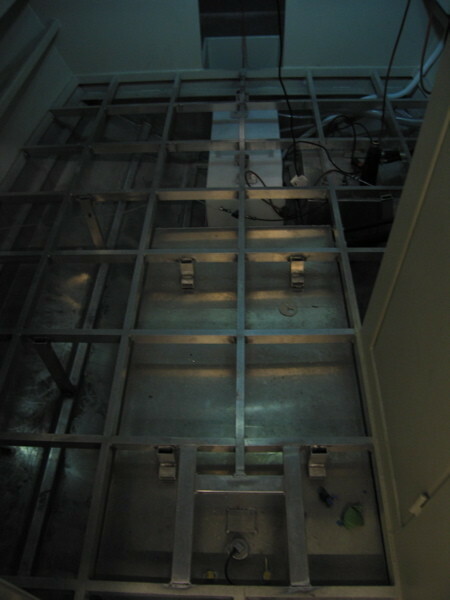 Overall, a fantastic project! 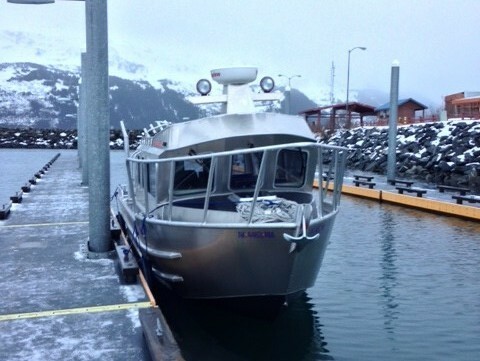 Sea trials took place in Whittier and the vessel is now berthed in Seward and is being thoroughly enjoyed and used regularly. 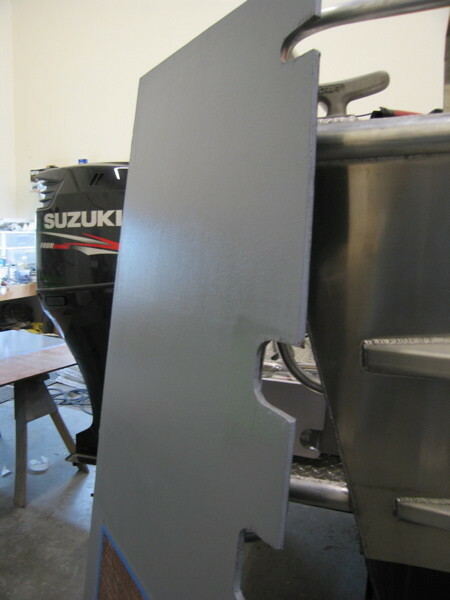 So, if you have a bare hull, partially finished hull, or anything in-between, feel free to contact us. 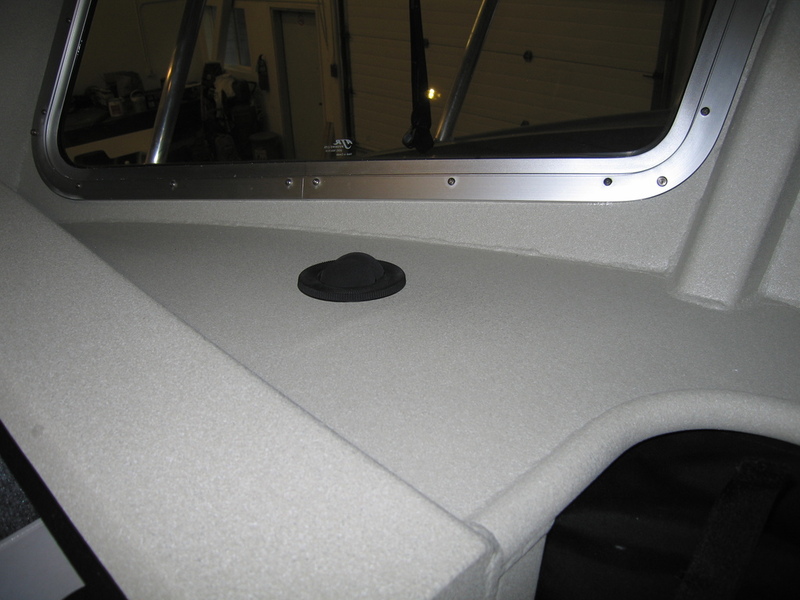 No matter the hull material-aluminum, fiberglass, or wood- we can meet your needs. 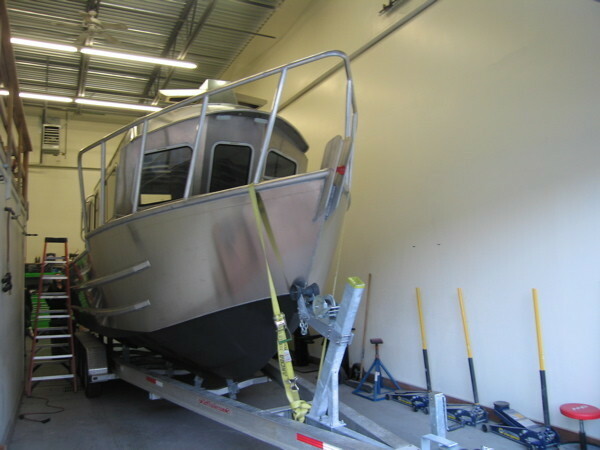 From the Spring through to the Fall of 2013, Jordan Morse undertook the completion of a bare hull aluminum sporfisher and was assisted at various points in the project by Joel, Chad, periodic contract labor, Greatland Welding and Machine in Palmer for additional fabrication and welding, and Kevin’s Upholstery in Chugiak, who manufactured all of the window coverings, seat cushions, and exterior covers. 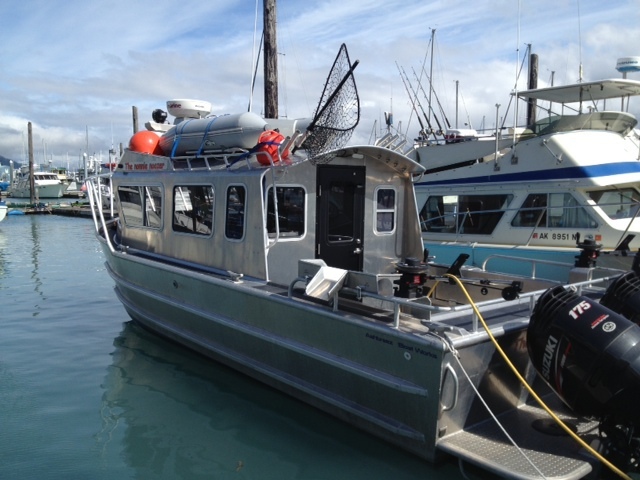 It was a very successful project and sea trials took place in November of 2013 in Everett, WA with both the owner and Jordan on board. 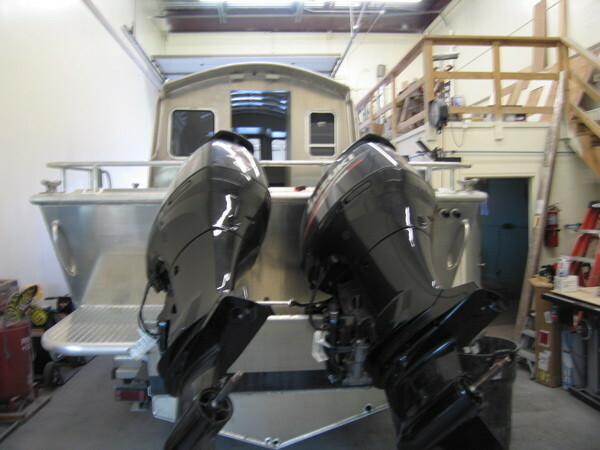 Currently, the owner is enjoying his dream, using it extensively off the coast of Washington and Oregon, using it for albacore and other sport fishing. 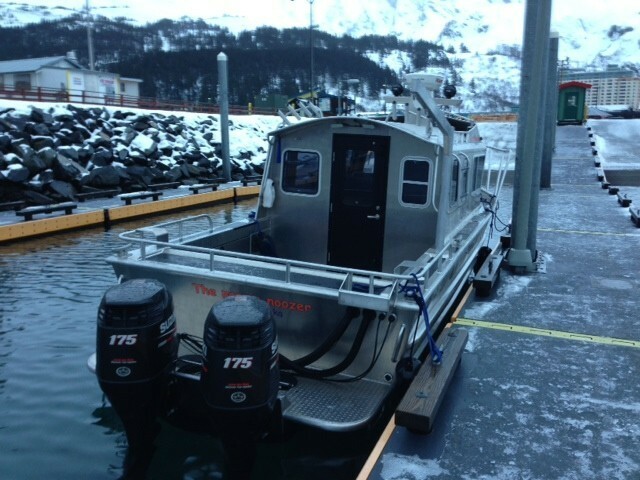 It is quite a “tricked out” vessel and it marine surveyed very well before leaving the confines of the shop. 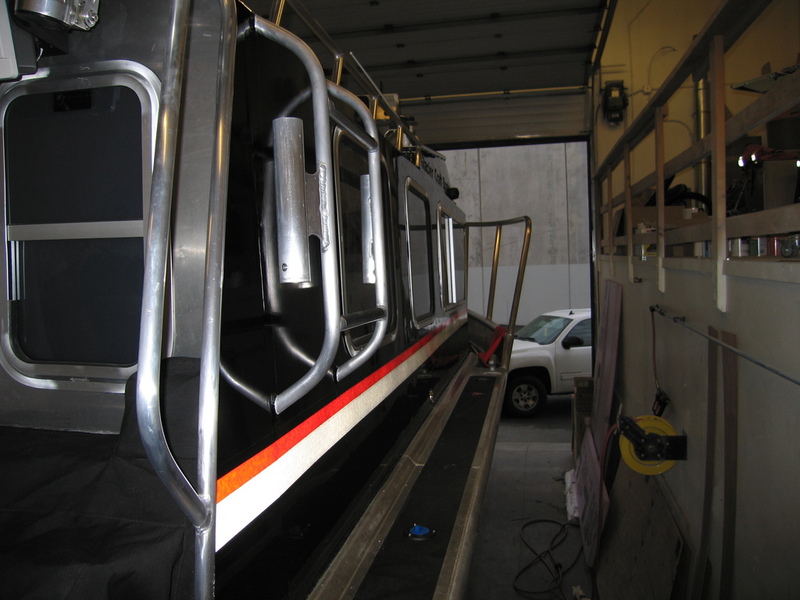 What follows are the photos we took the morning it left the shop, bound for Tacoma on TOTE. 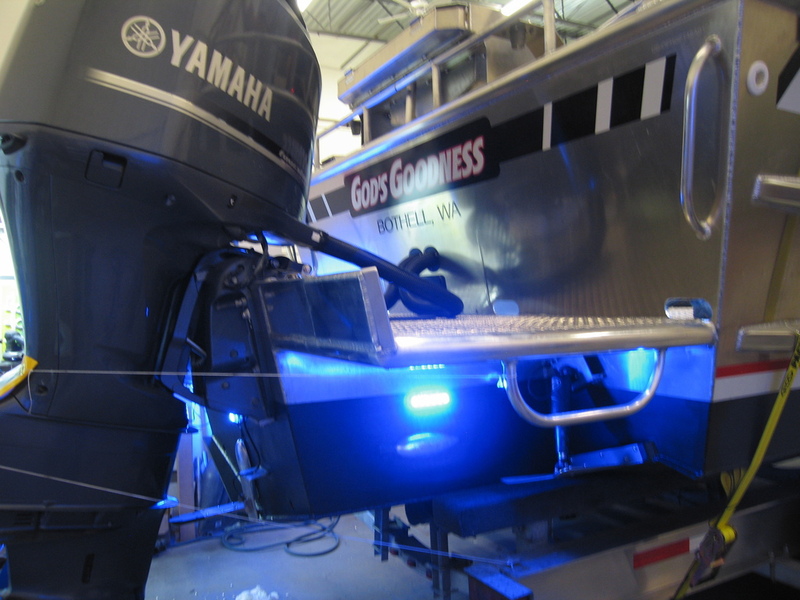 Vessel Overview: M/V God's Goodness is a 32' Aluminum Sportfisher, powered by twin Yamaha 350's with twin Star Tournament Rams, stainless 4-bladed props. 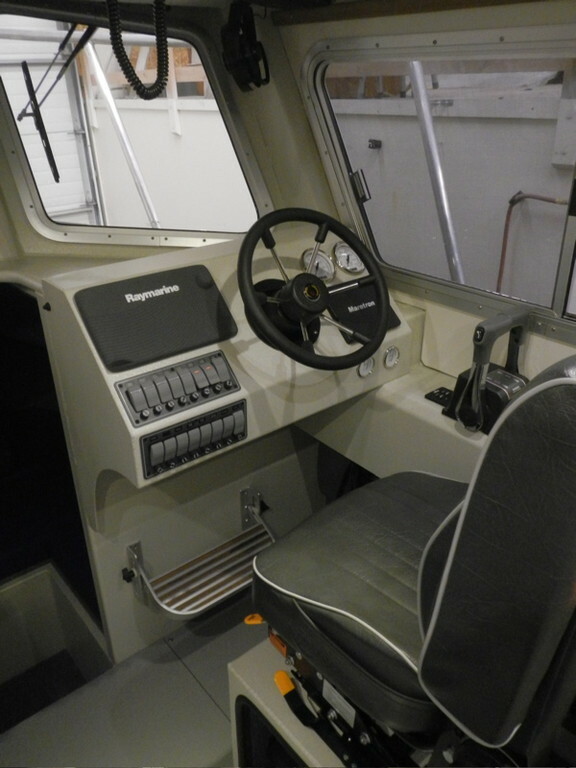 It was outfitted with two auto-retracting Lenco electric trim tabs and a dual Racor 3232 fuel filtration system with selector manifold. 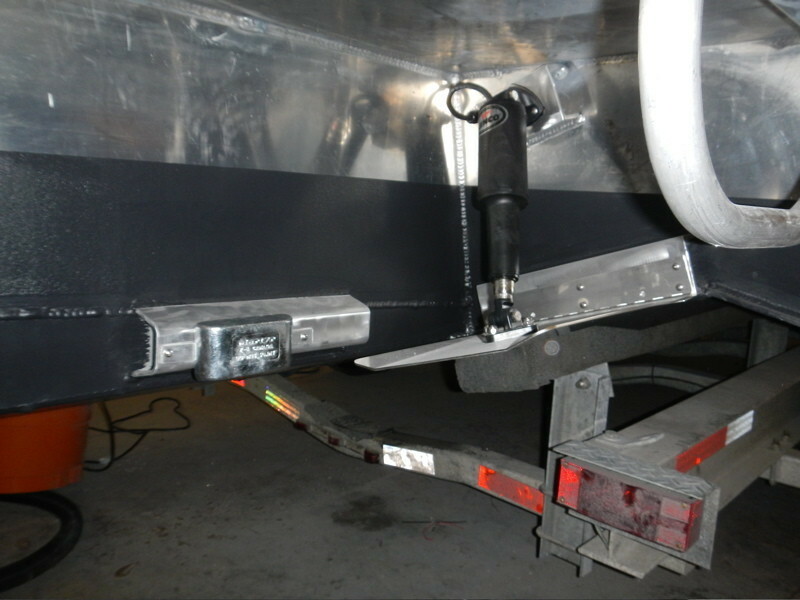 She is towed between ports on a custom Tuff Triple Axles 15,400 lb. 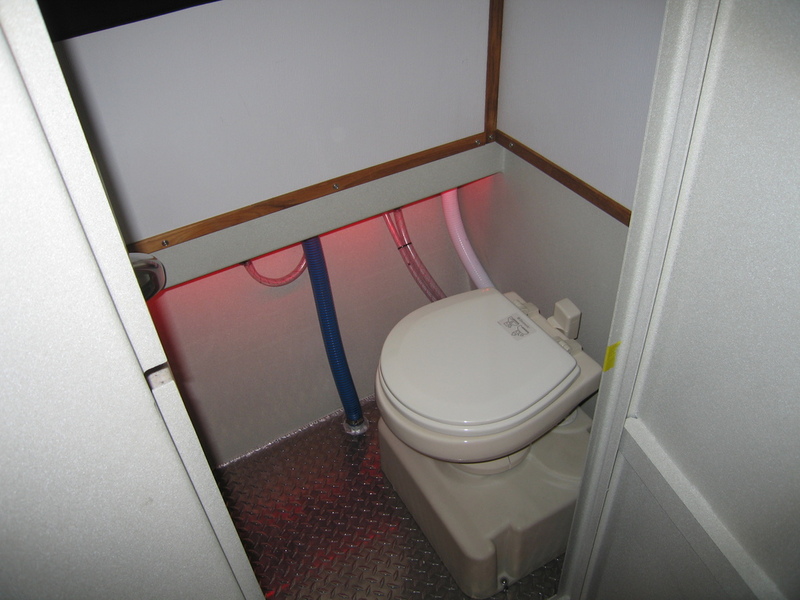 capacity trailer. 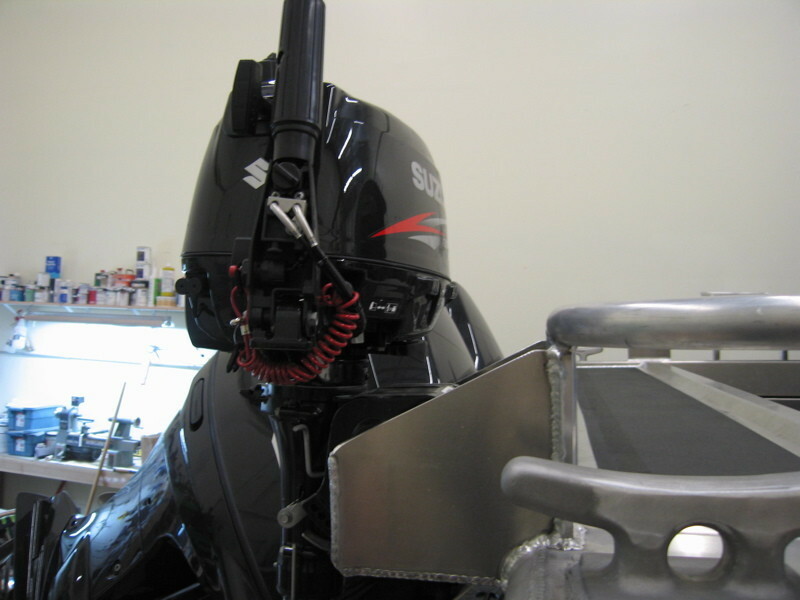 The steering system is a Seastar hydraulic system. 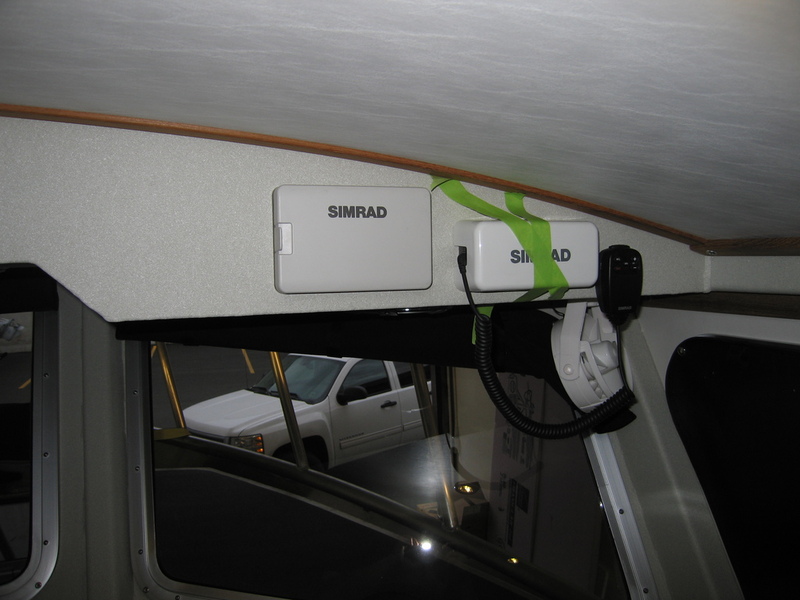 Controls are dual station Command Link Plus, integrated into the navigation system. 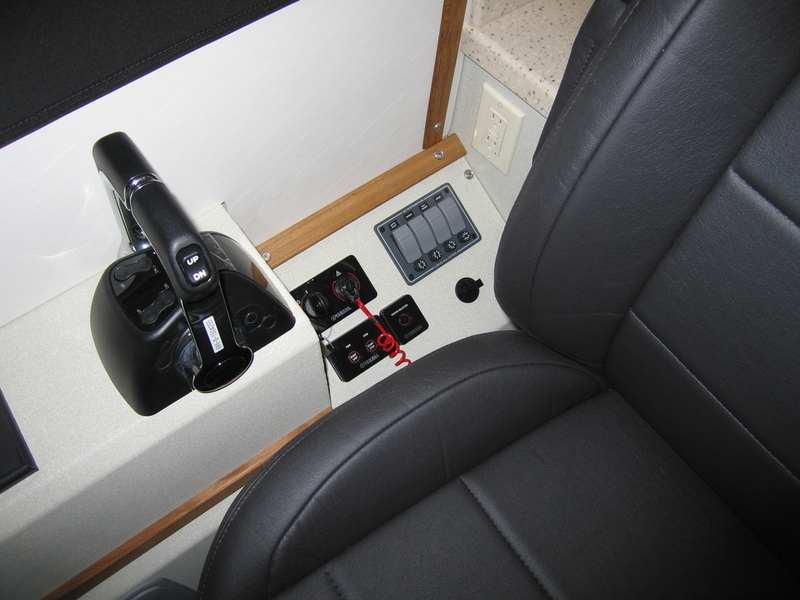 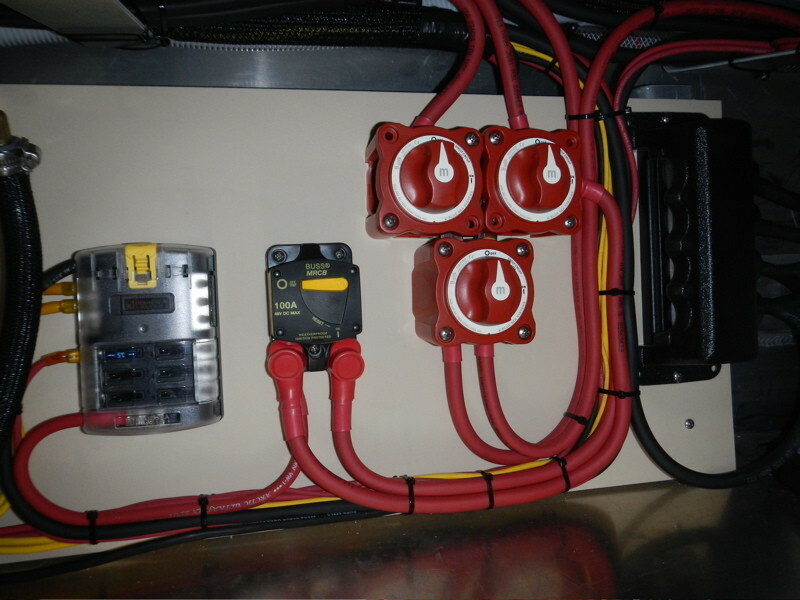 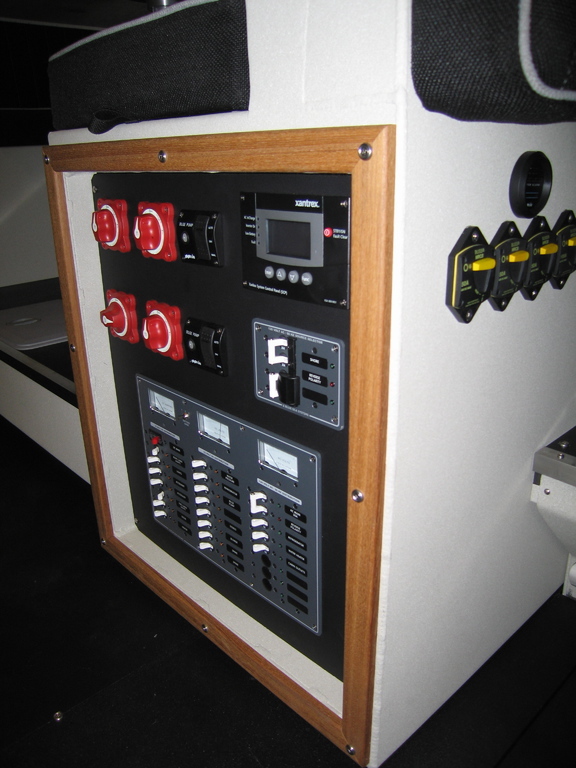 The electrical consists of two, Type 32 batteries, 30 amp shore power , and a Freedom SW 3012 150 amp charger with Xanbus System control panel. 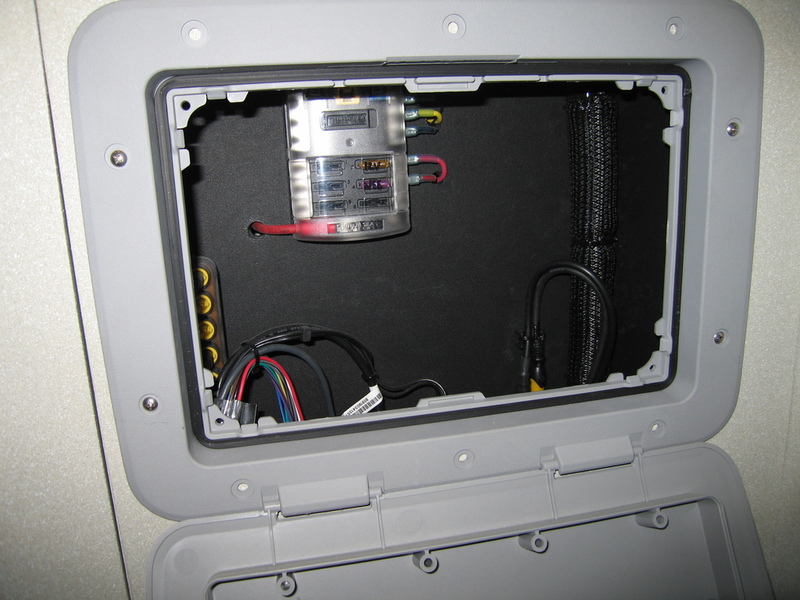 The electronic system is unbelievable. 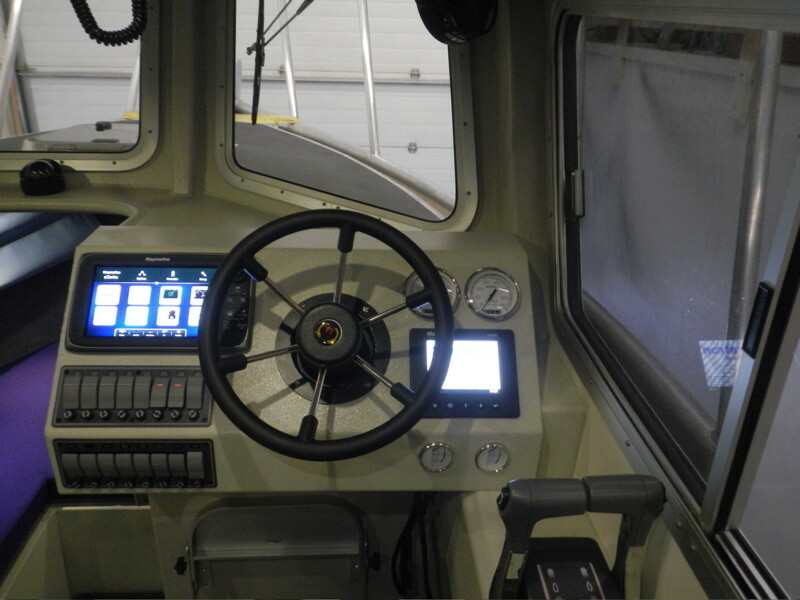 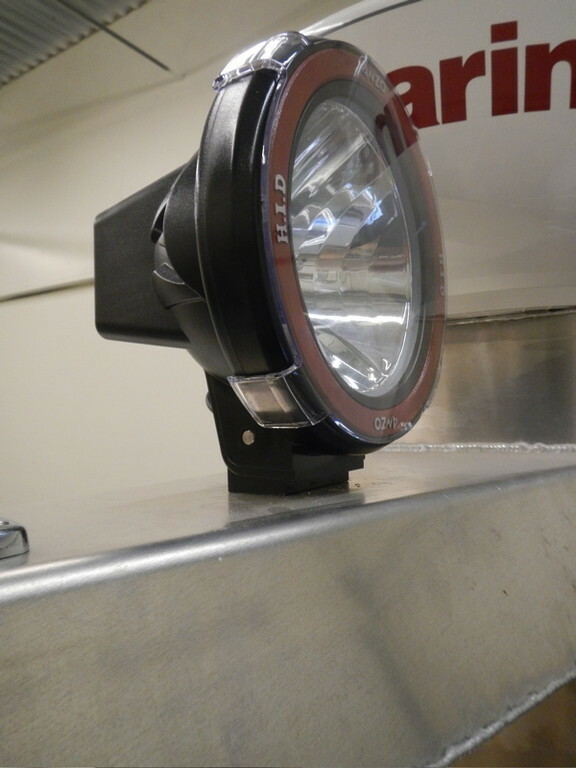 There is a Flir MD625 thermal night vision system with dual station capability and Simrad AIS system, VHF radios (2), one 8" and two 12" multi-function display monitors, autopilot, WM-2 weather module and satellite radio, broadband and chirp sounders, EPIRB, WEP-2 network (expansion port for Ethernet), and radar. 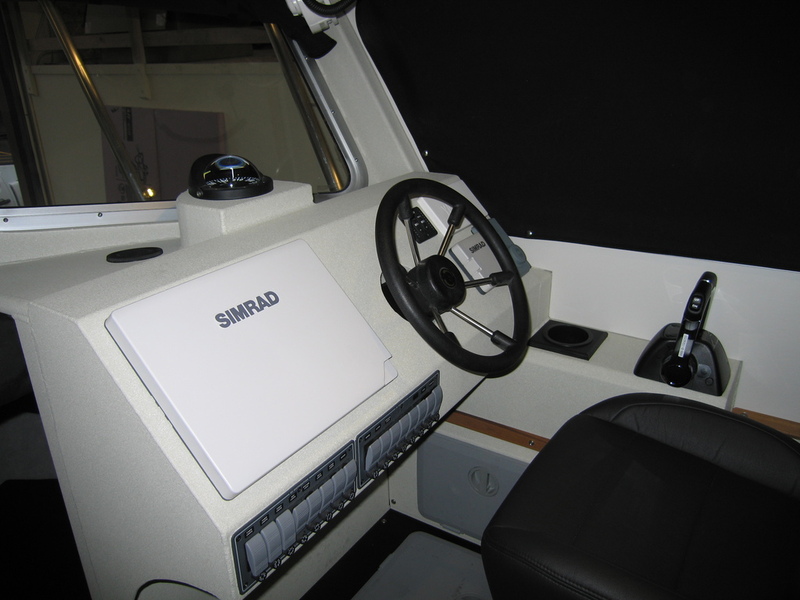 The entertainment system consists of a Simrad sonic hub stereo system, a Sony 600 watt/4-channel marine amplifier, JL Audio cabin speakers, and Boss outdoor speakers in the aft deck cockpit. 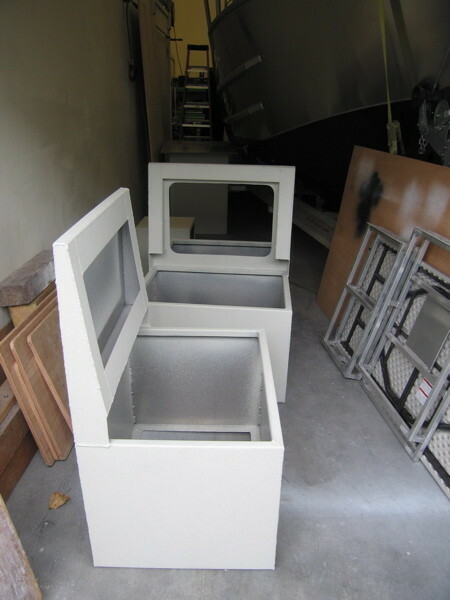 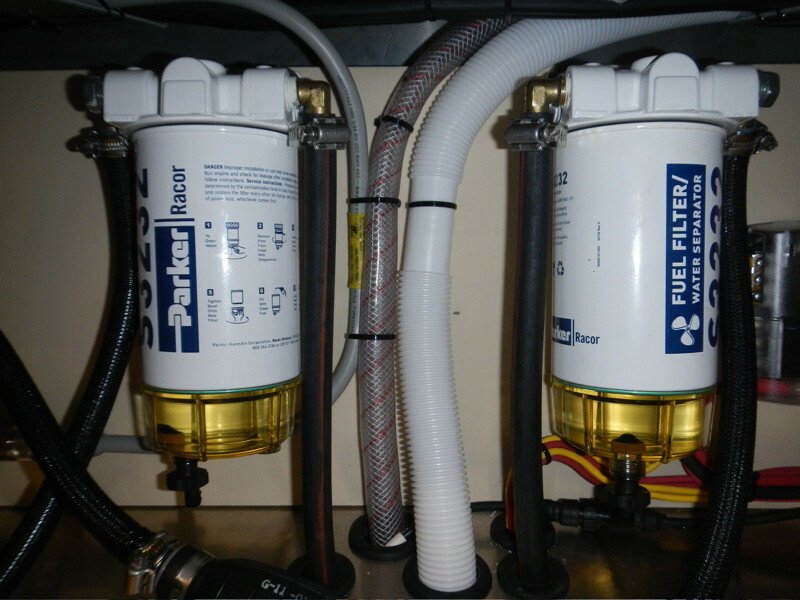 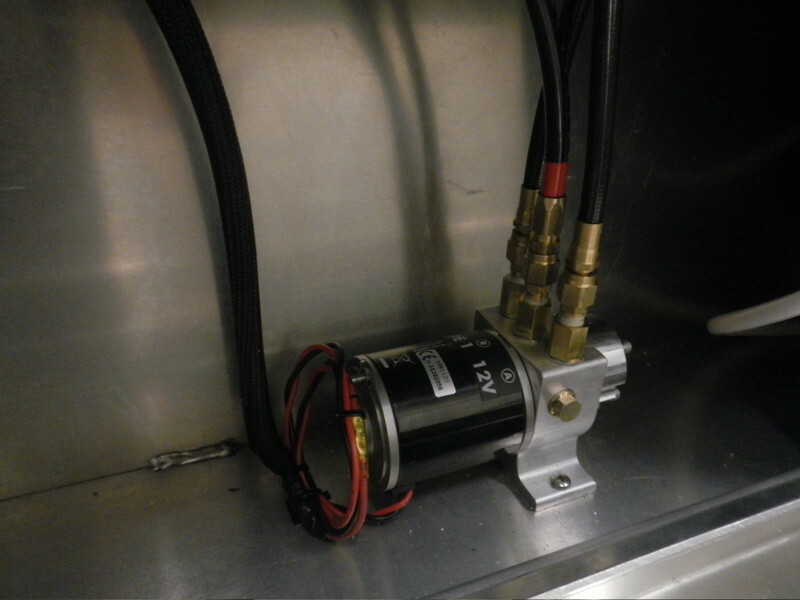 Fuel capacity consists of two, 130 gallon aluminum tanks; there is one 35-gallon aluminum Diesel tank for the heater/stove, one 60 gallon fresh water tank, and a 6 gallon Isotherm stainless hot water tank. 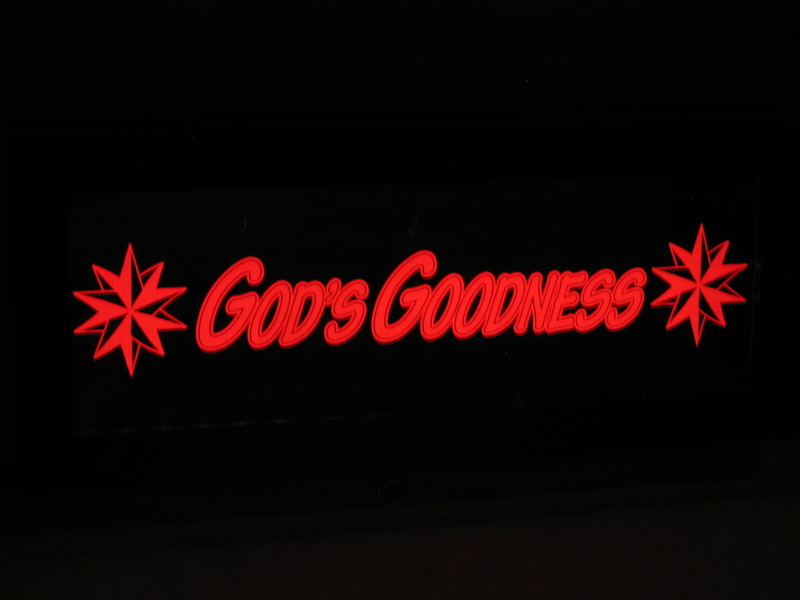 Exterior: What follows is a slide show of the exterior of "God's Goodness" By hovering over the slide, captions descibe the picture content. 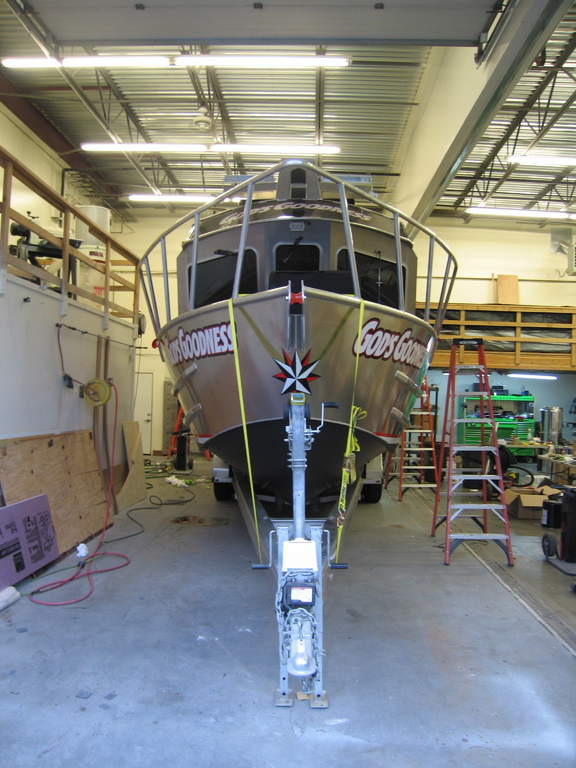 "God's Goodness" made the trip to Tacoma in fine shape on board TOTE. 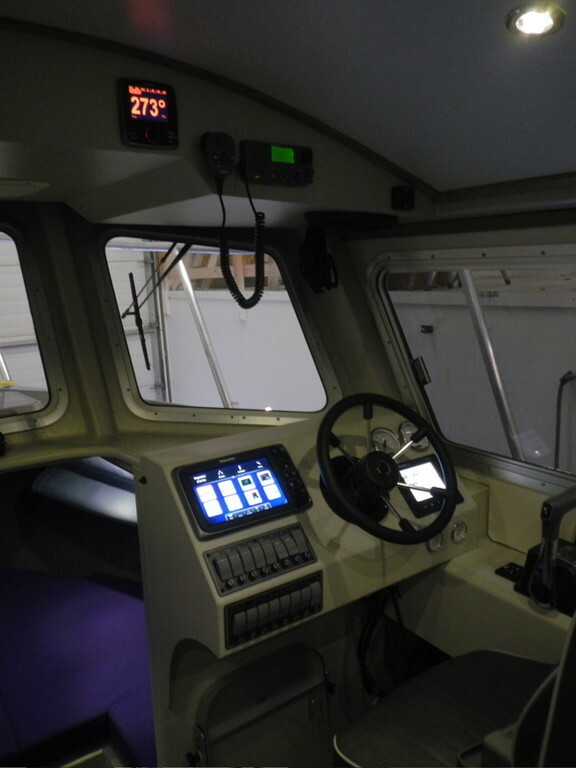 She is docked here, after her first sea trial in Everett, Washington.